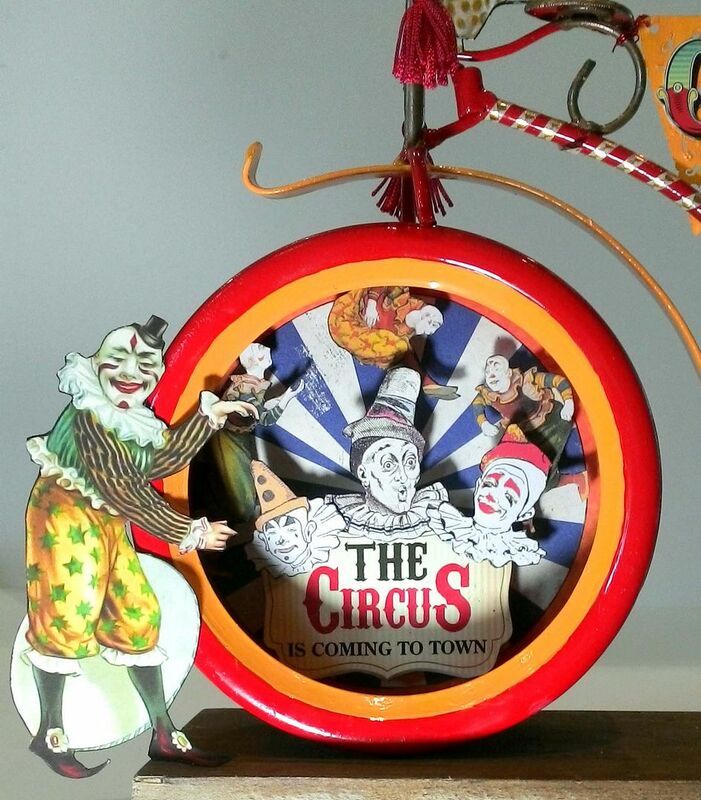 The circus is coming to town, led in by a parade by the clowns. In my version of a circus, it’s not the people who are in charge but the animals. Standing on the back wheel of the bike is the ringmaster himself Mr. Elephant. 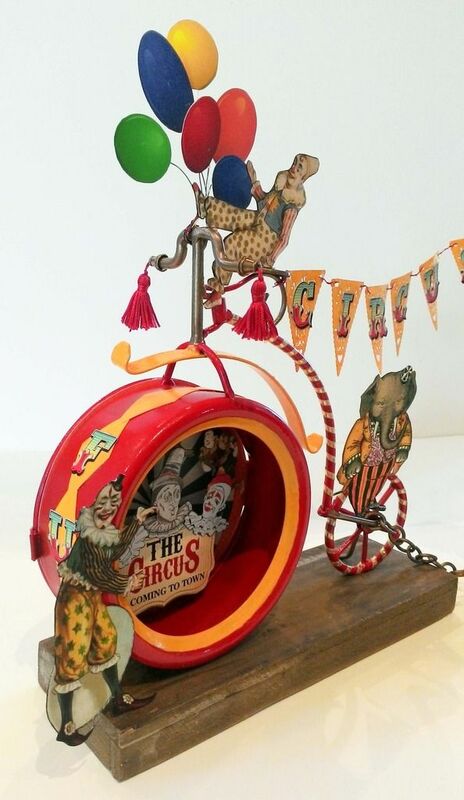 The inspiration for this fun filled piece is the Metal Bicycle Frame; it makes such a cool back drop for clown's shenanigans. I could also see this piece being incorporated into other themed projects like Steampunk or a summer/ children themed piece. 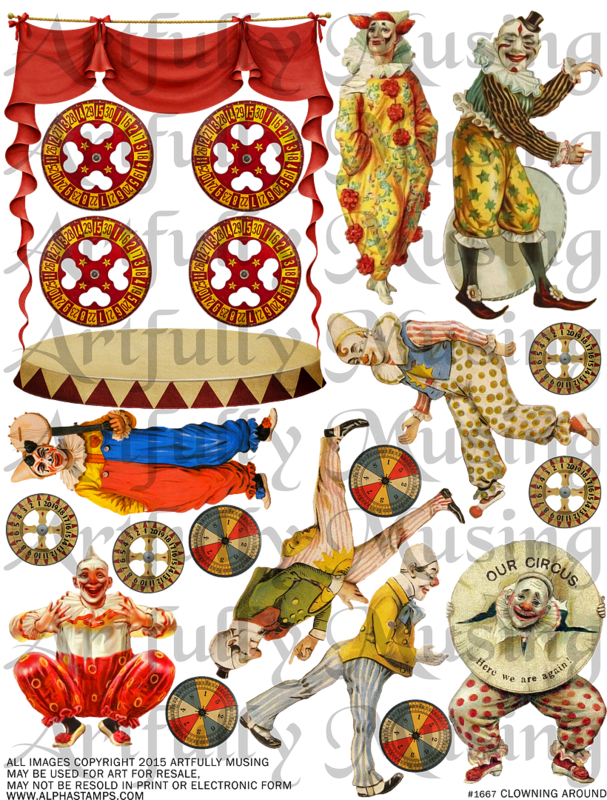 Many of the images you see are from my new “Clowning Around” collage sheet. 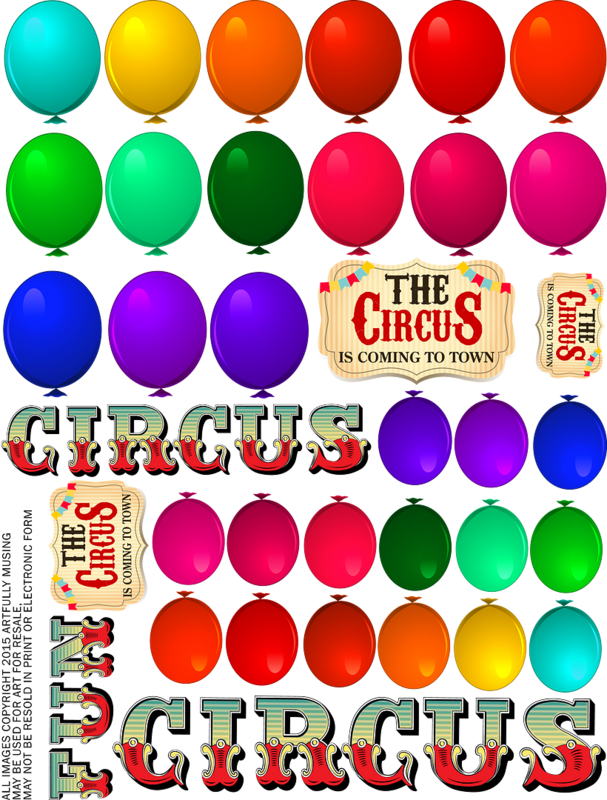 I also cooked up a FREE Circus collage sheet for you, which is filled with balloons, letters and a couple of circus signs. You’ll find the sheet at the bottom of the post. Feel free to download it and use it for your art. 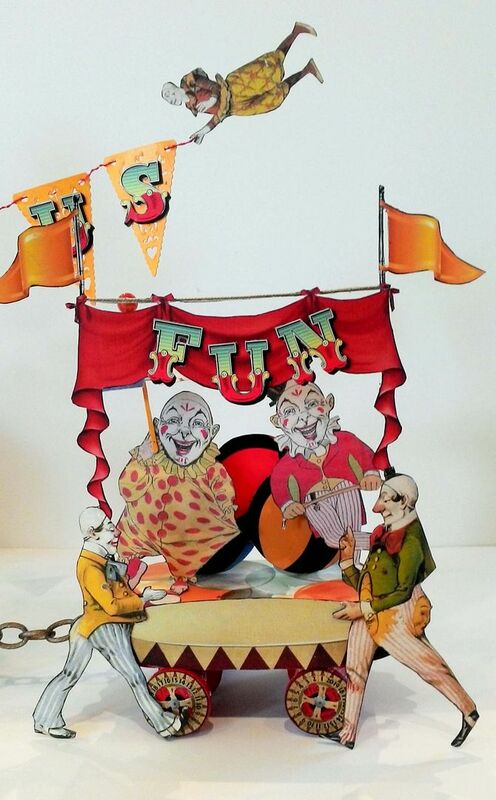 This sheet included seven wacky clowns, a stage and 3 sets of wheel covers. 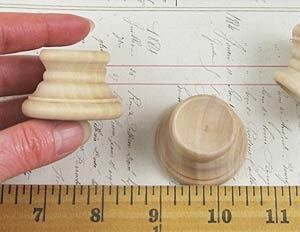 The wheel covers are sized to fit large and small wooden thread spools. I started by removing the bike from the wooden platform by unscrewing the nuts from the screws. To make the process fast and easy I sprayed the bike with red spray paint that is made for metal (found at my local hardware store). Once the paint was dry, I wrapped the frame and back wheel with Gold Harlequin with Diamonds Tape. Next, I painted the handlebars and seat with Metal Patinas Aged Bronze paint. 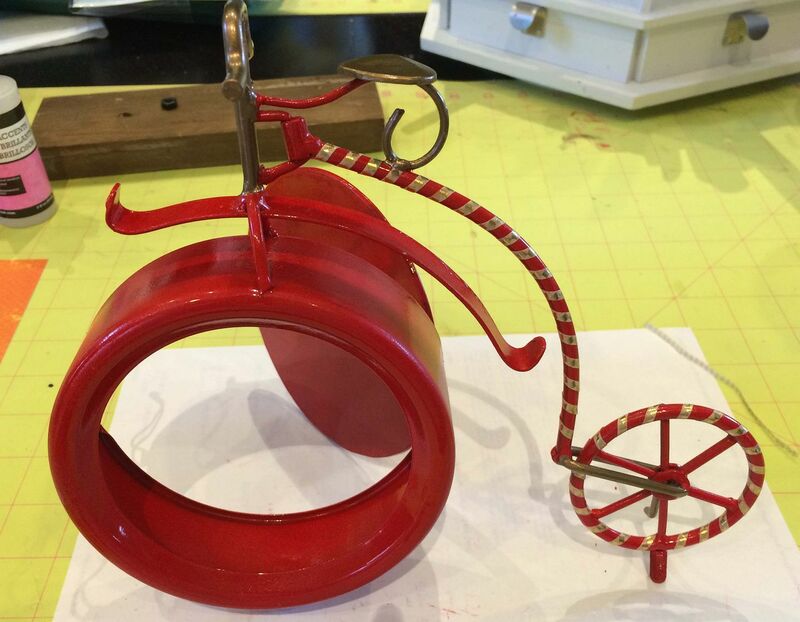 The back of the front wheel of the bike opens up to make it easy to add embellishments. 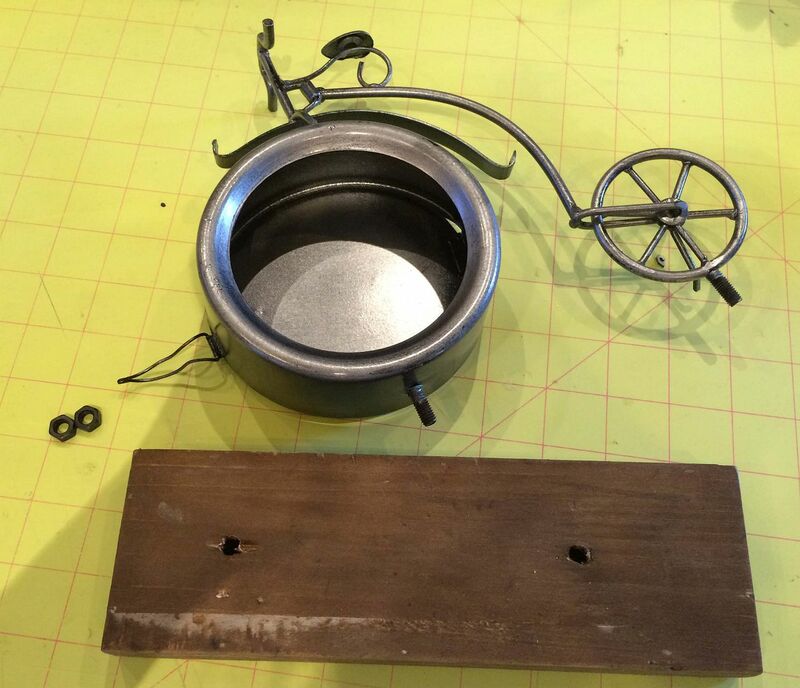 The wheel is really deep so there is lots of room to add large dimensional items. 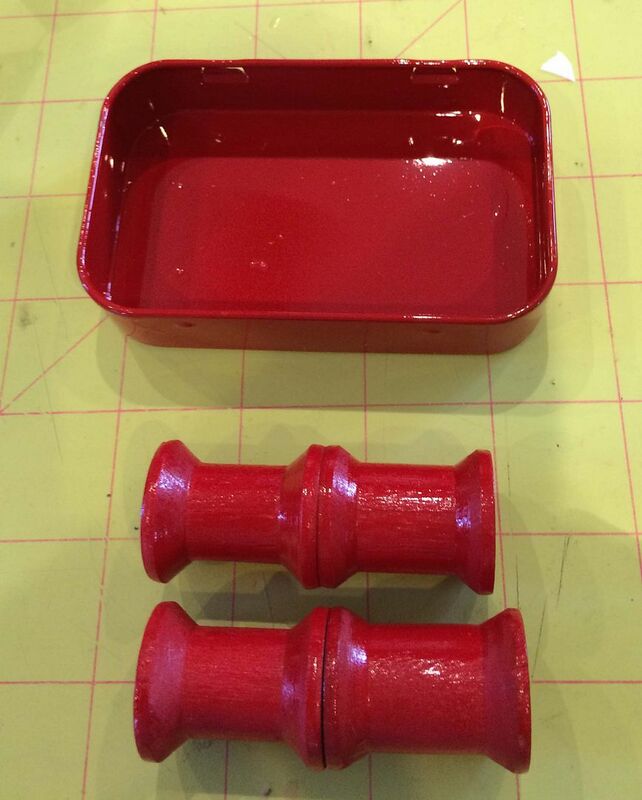 To make the stage that is pulled by the bike, I used the same red spray paint to paint the bottom of an Altoids tin and 4 wooden spools that are glued together. 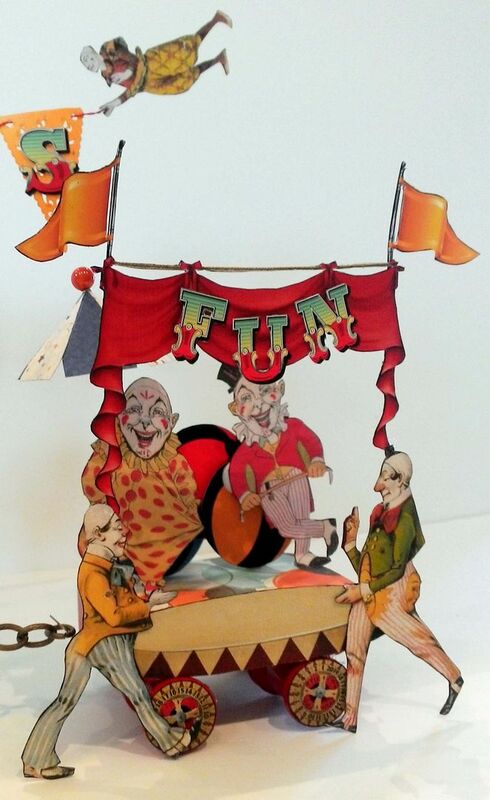 The stage comes from the Clowning Around collage sheet. Tip: Notice how narrow the curtains at the bottom of the stage are which would make it difficult to stand up without support. I added the clowns to the front of the stage to give that area support and I also like how it looks. NOTE: All the images I used are back with decorative paper or cardstock to make them stiffer so that they will stand up when attached to the piece. The bottom of the Altoids tin is the top of the stage and is covered with paper from the Carnival 6x6 Paper Pad (which is where all of the paper you see comes from). 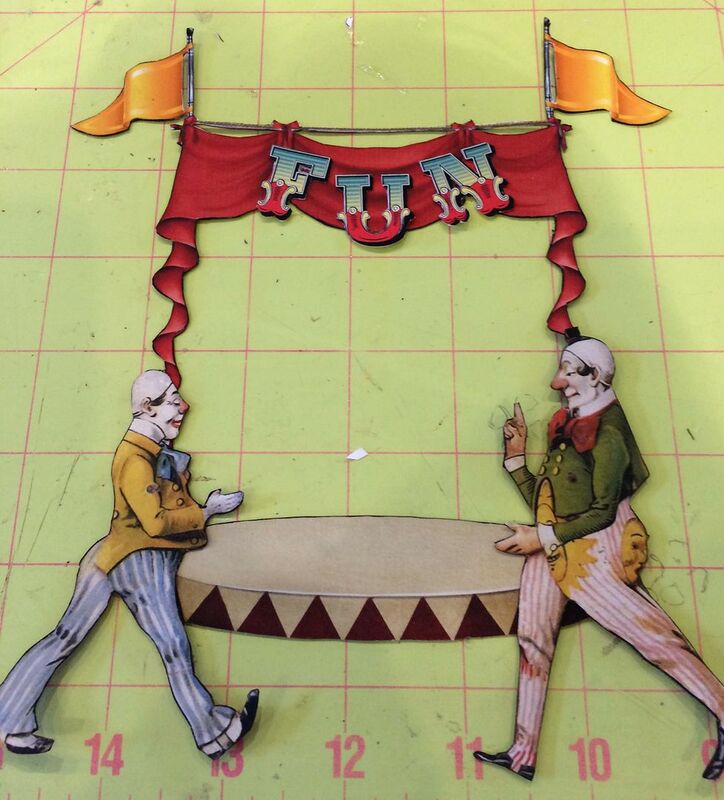 The clowns on the stage are from the Reversible Clowns Collage Sheet. 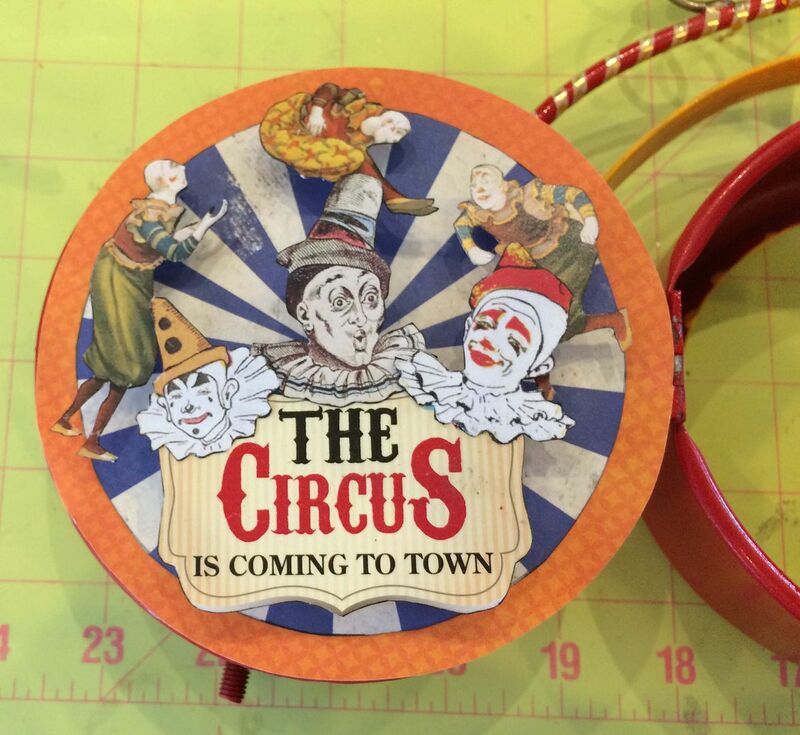 I glued the wheel covers from the Clowning around collage sheet to the wooden spools and attached the paper stage to the side of the Altoids tin using E6000 glue. 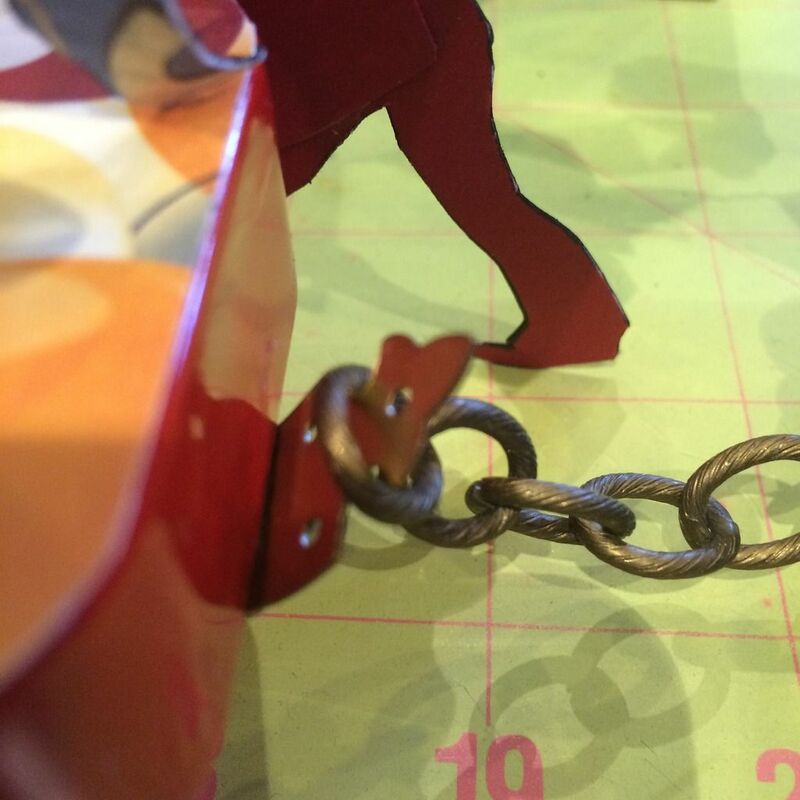 I bent a faux hinge and attached it to the Altoids tin to give me a place to hook the chain (from my stash). You can see in the picture below how it hooks under the edge of the Altoids tin. The tassels on the handlebars are made from pulling some of the tassel string through a hole in a brass cone, gluing the string in place and then gluing the cones to the ends of the handlebars. 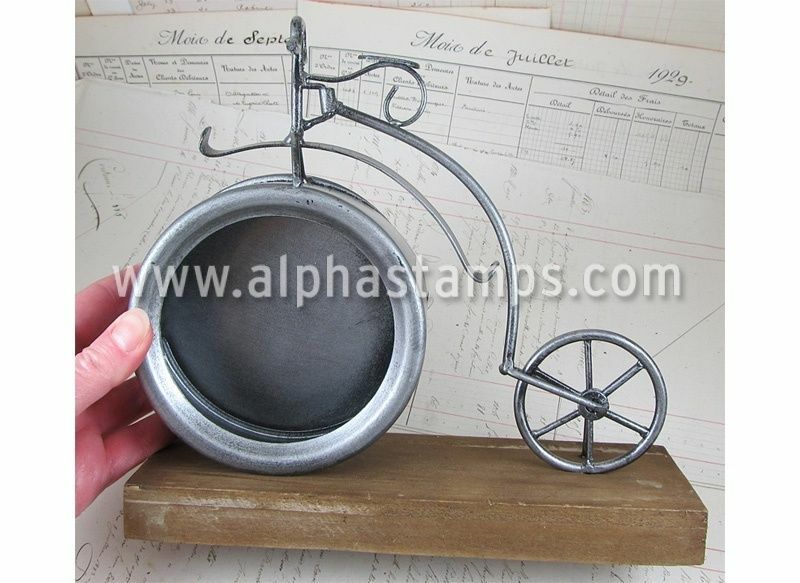 I painted part of the frame and large wheel with the Metal Patinas Ochre paint. I punched diamond shapes from white cardstock, glued them together and painted them yellow. 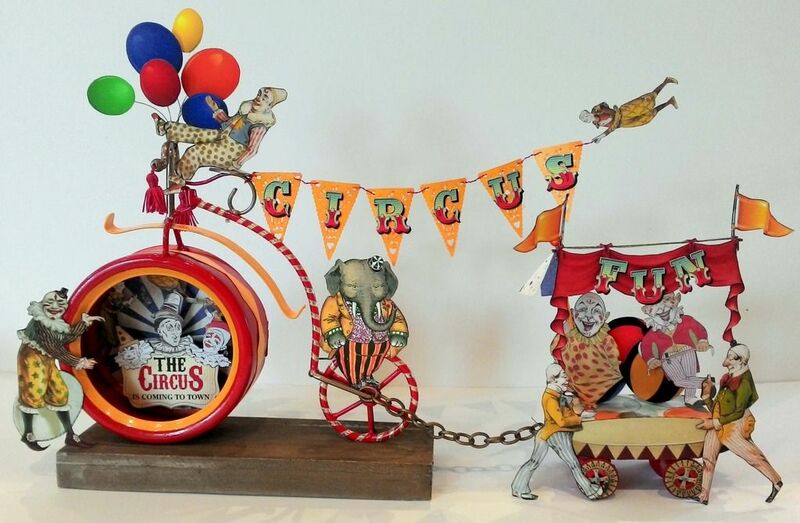 After gluing them to the front wheel I added “FUN” from the free Circus collage sheet. 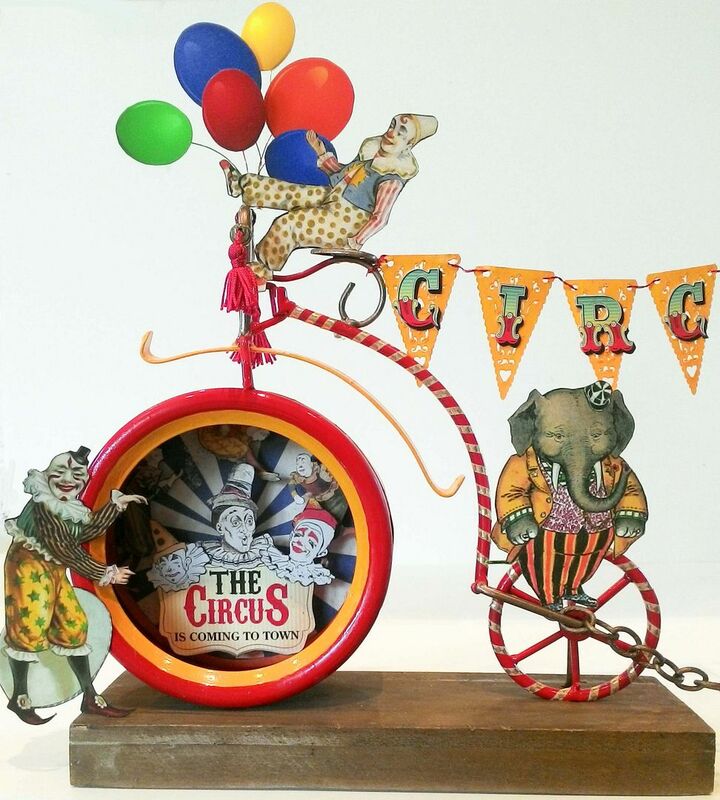 The balloons are also from the Circus collage sheet. I glued wire in between the balloon image and a piece of decorative paper then used the wire to attach the balloons to the handlebars. 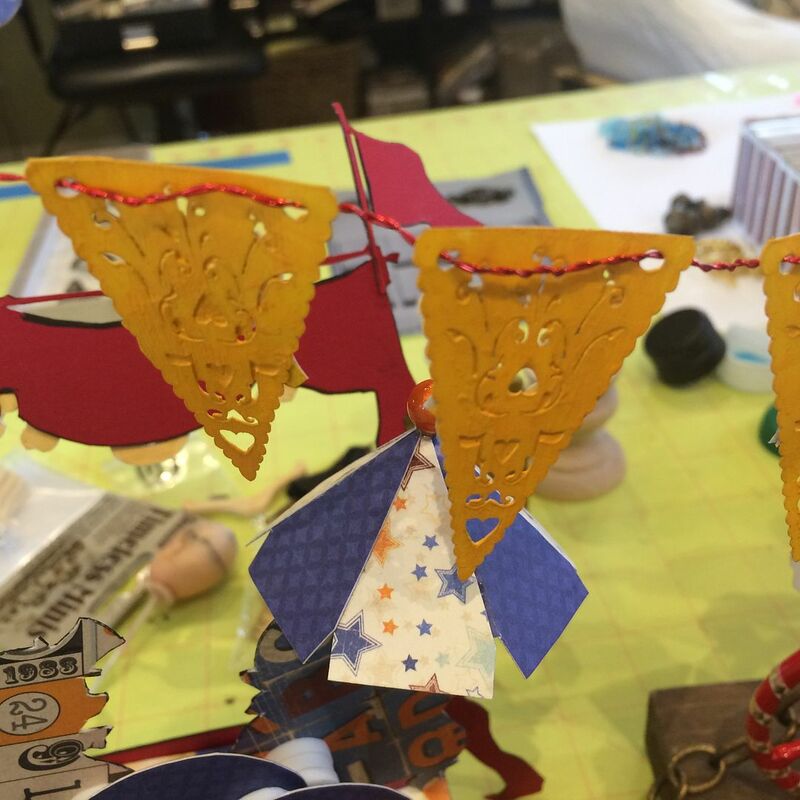 To make the circus banner, I started with Mini Lacy Banner Flags which I painted yellow. Next, I added the "CIRCUS" letters from the free collage sheet. I twisted 2 pieces of red wire together and threaded it through the pre-punched holes in the flags. The wire is threaded through the backs of the flags. The reason I used two strands and twisted them together was to make the wire stiff enough to hold the weight of the flags and the clown hanging on at the end. 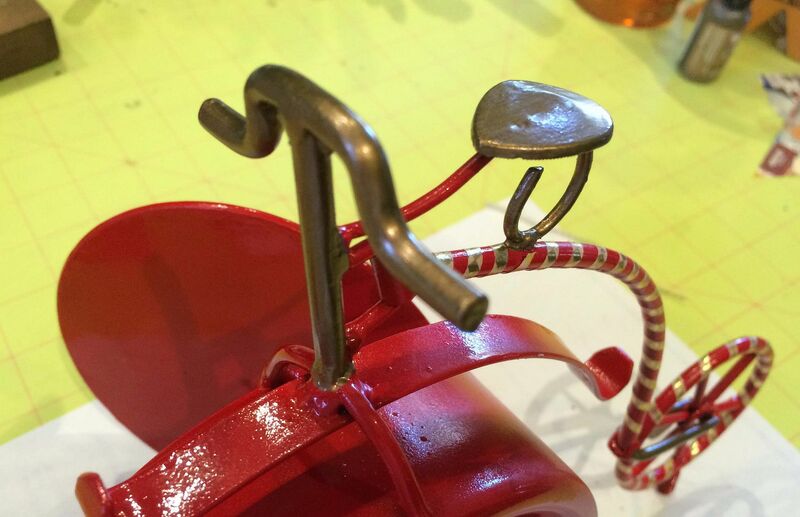 Make sure to use enough wire to have extra at both ends; on the one end to wrap it around the bike handles and at the other end to attach the clown. To keep the flags in place you can add a tiny dab of Glossy Accents to the back at each hole and use a little on the handlebars before wrapping the wire around the bars. Feel free to use the images on this sheet for your art. 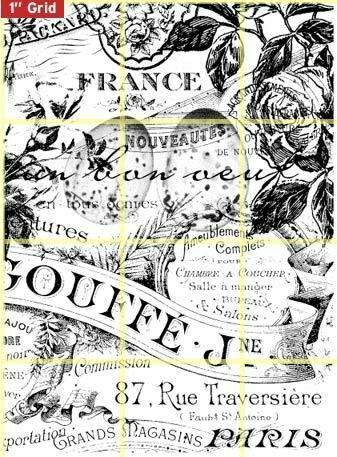 To download the collage sheet, right-click on the image and select “Save As” from the menu. 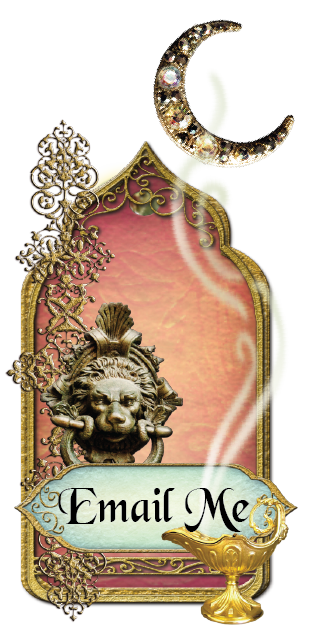 All you Steampunk and fantasy fans out there I've got some cool stuff coming your way! Stay tuned!!! What can I say, a girl has gotta have her shoes! And for those of you who also love shoes, I have some shoe themed projects to share with you. 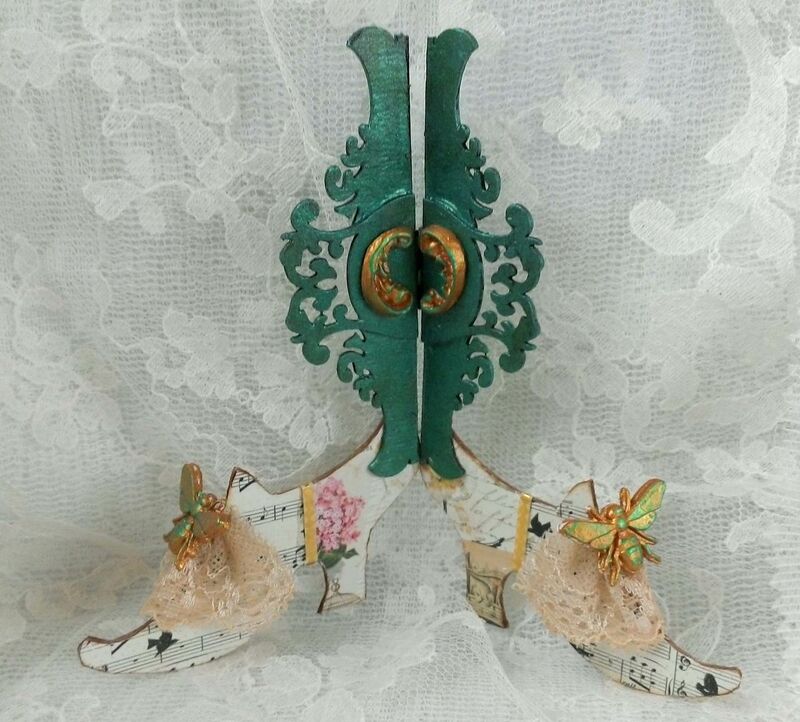 In this post I’ll cover how to make mini shoe picture stands out of images of shoes, shoe picture stands from chipboard shoes and a Paris inspired paper shoe. In addition to the tutorials, I have two new collage sheets and a new digital image set. 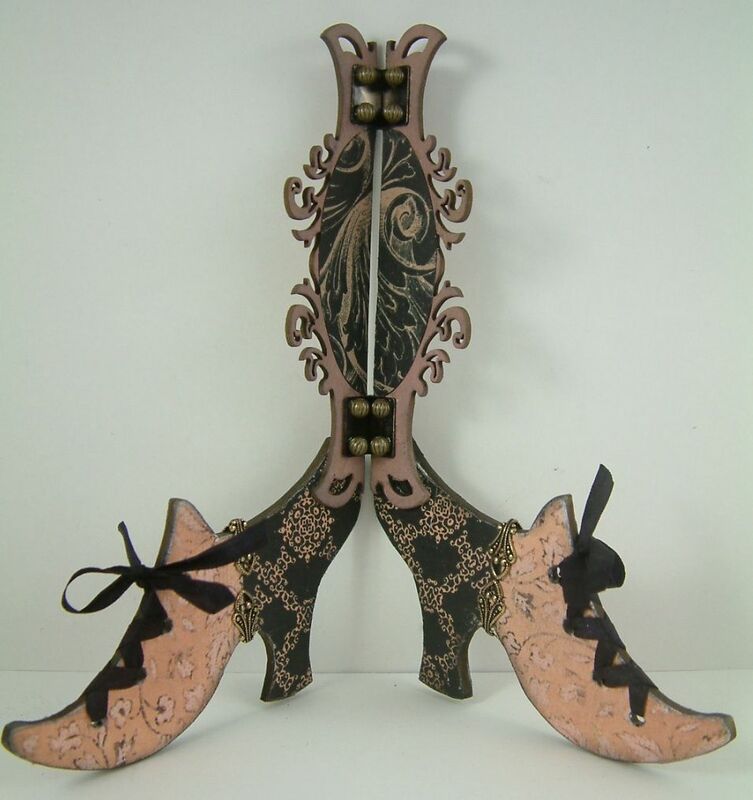 Picture stands made from shoes are great for displaying pieces of art or photographs. 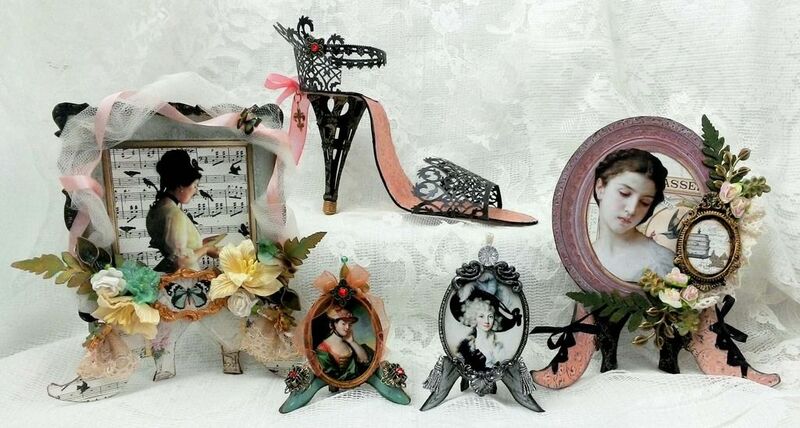 In the samples below, I am using the stands made from chipboard shoes and die-cut labels to display collaged pieces. 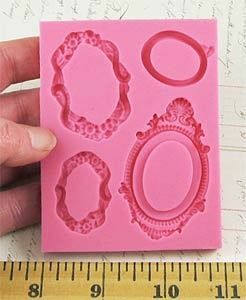 They would also work great for displaying something smaller like an ATC. 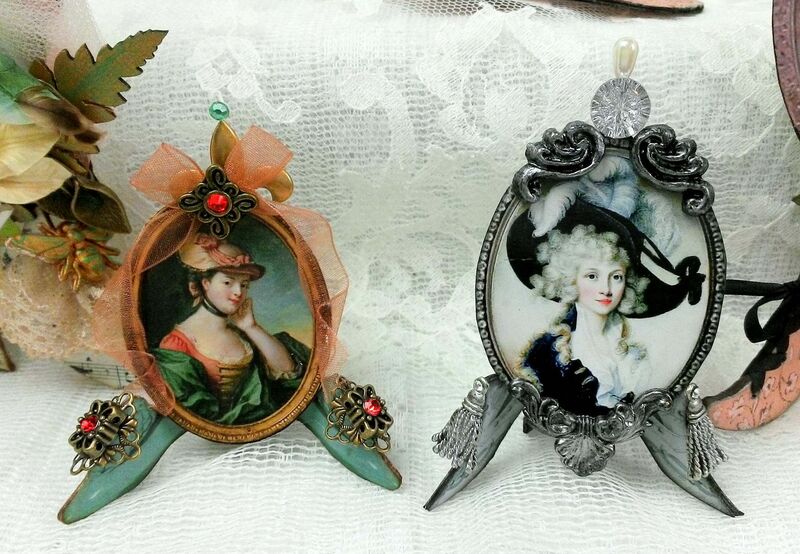 These stands are simple to make with endless style and theme possibilities. 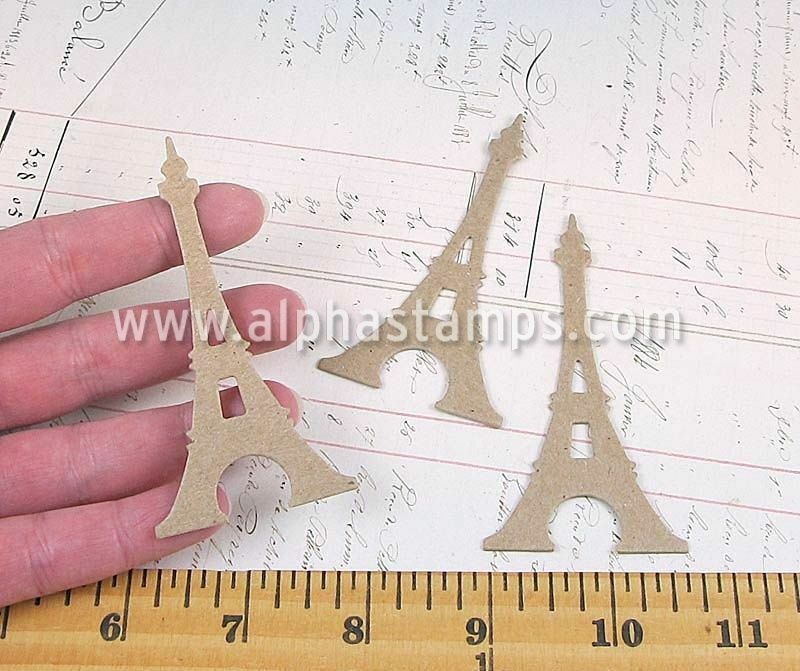 This Paris inspired paper shoe is super simple to make and is sporting a heal made from three chipboard Eiffel towers. 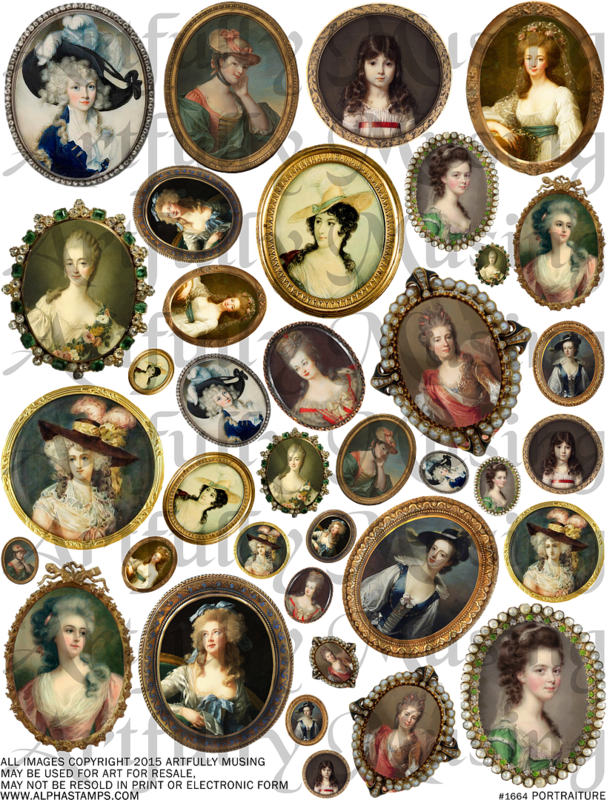 This sheet is packed with vintage framed lovelies. 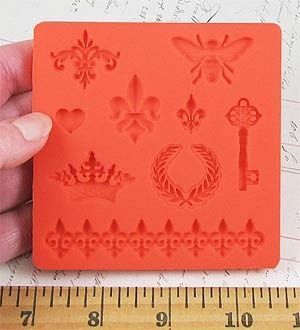 Some of the smaller images are sized to fit in the Oval Frames Silicone Mold. For the sample projects, I printed the sheet on glossy presentation paper. 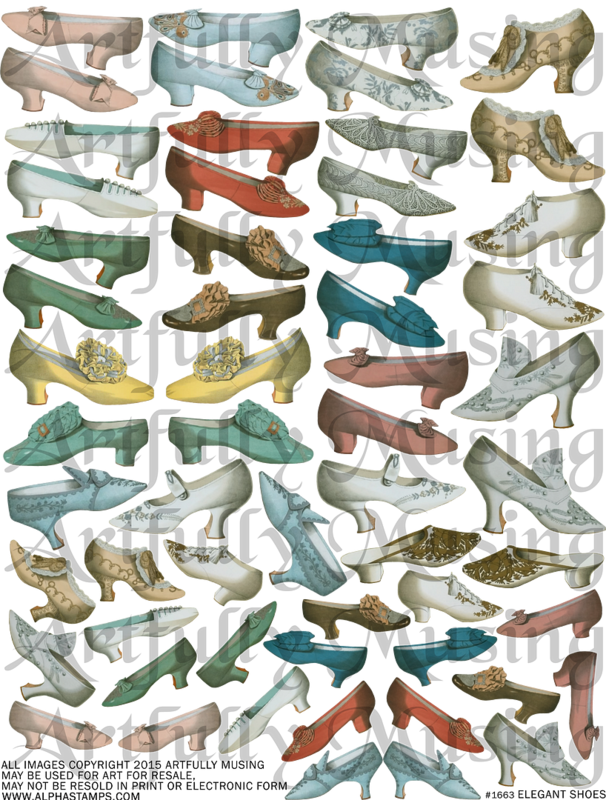 The collage sheet contains 17 unique pairs of shoes in two sizes. I used the larger version of the shoes for the mini shoe stands. The digital set contains 25 unique pairs of shoes for a total of 50 images. All of the shoes on the collage sheet plus and additional 8 pairs of shoes are included. The shoes are approximately 2 ½” to 3” wide. I made them larger than the collage sheet as it gives you the ability to resize them with better resolution. Digital files can be resized, rotated or flipped as needed. The files are in a .png format. PNG formatted files have a transparent background making it easy to layer an image over other digital images. You can open .png files using graphic programs like Photoshop Elements. Digital collage sheets and digital images can be saved to your computer and printed as many times as you wish. 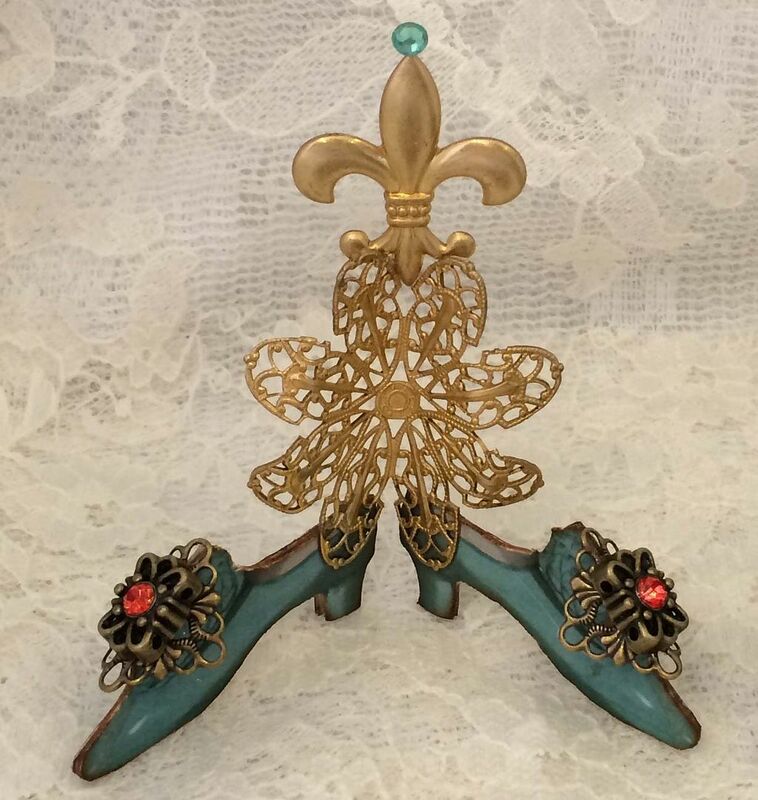 For those of you who have followed me for a few years you might recognize this project as I have posted some samples of shoe stands in the past. I started by selecting two labels from the Die-Cut Stackable Labels set (there are six to choose from). I choose two so that the back of the stand would be high enough to support the art piece. Using a ruler and an X-Acto knife I cut the long piece in half horizontally and vertically which resulted in 4 pieces. I cut the wide piece in half. Next, I glued the chipboard pieces together. 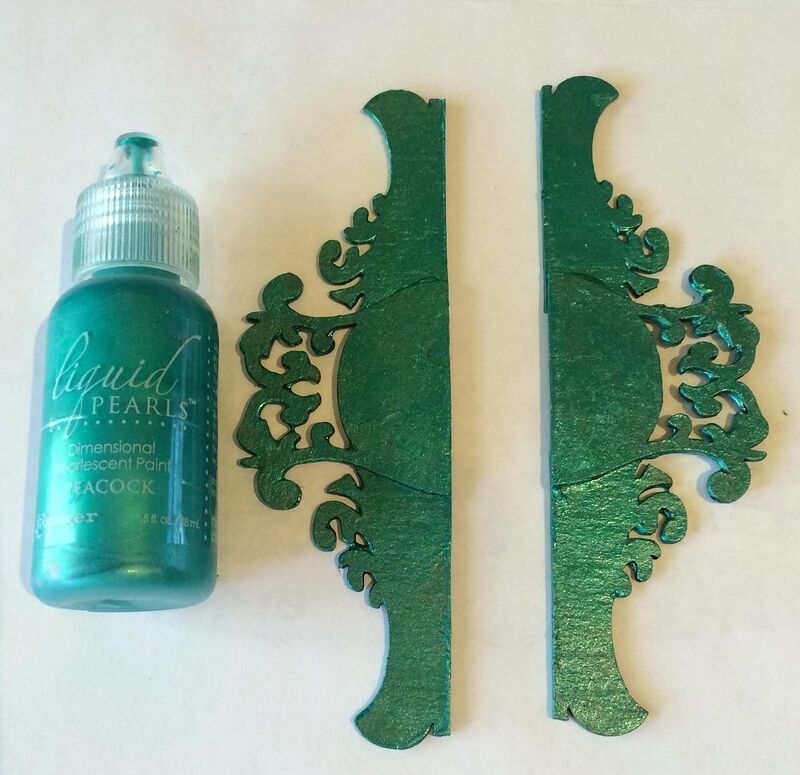 I painted the chipboard with Peacock Liquid Pearls. I glued the hinge to the back of the chipboard using E6000 glue. In the picture below you can see how I was able to make the back longer by cutting it in half and gluing the half to the edges of the center section. NOTE: When you attach the hinge, be sure to leave a gap of at least 1/8” or more. If you don’t leave a gap you won’t be able to position the sides to make a picture stand. You could also add brads to the hinges if you wish. Next, glue the chipboard back to the chipboard shoes. Notice the placement of the chipboard on the shoes in the picture below. Also notice how the bottoms of the shoes are lined up. Before gluing the back to the shoes, I like to use clips to clip the back in place to make sure that the picture stand will “stand” and that everything is lined up. To the chipboard back, I added clay swirls made from the Small Flourishes silicone mold. I painted the swirls gold, then using my finger I lightly brushed on some of the Peacock Liquid Pearls paint. 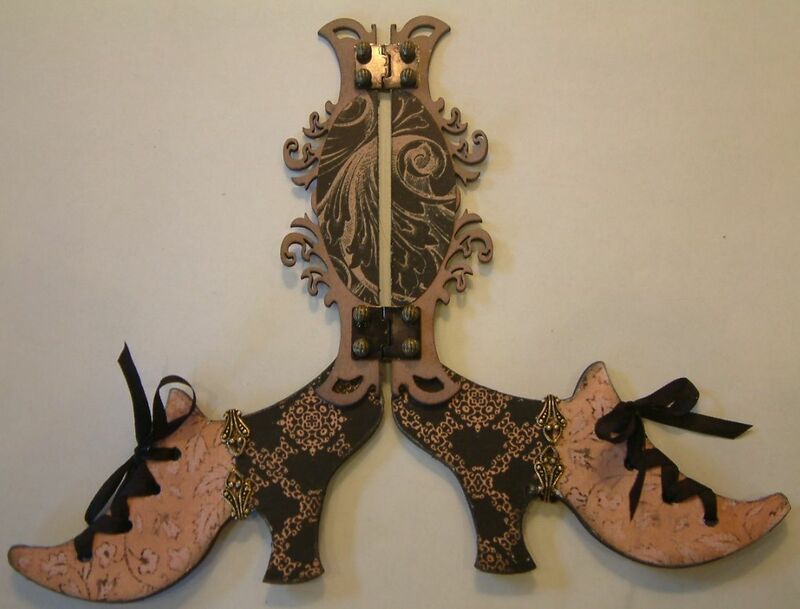 I decorated the chipboard shoes with paper from the Harmony Paper Pad and Gold Harlequin Tape. On the top of the shoes is gathered lace. The final decorative touch on the shoes is clay bees made from the Royal Icons Silicone Mold. I painted the bees using the same technique as I used to paint the swirls. 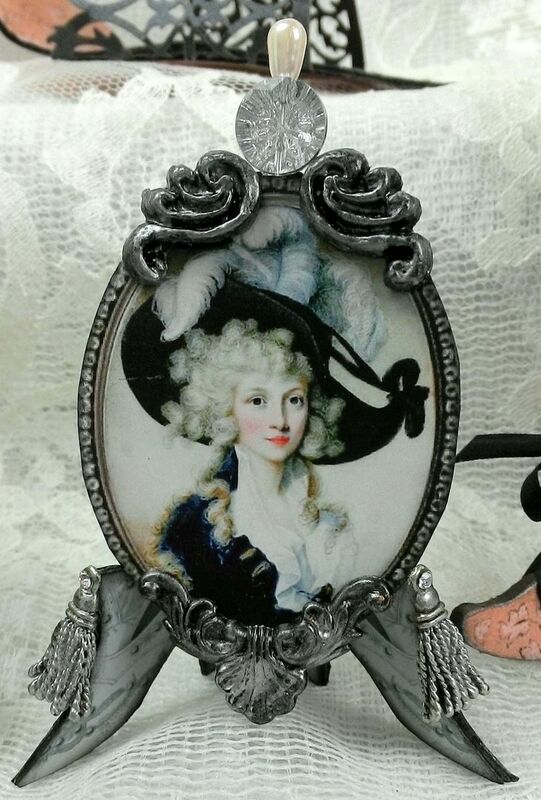 The frame of the piece is from the Elegant Frames Digital Image Set. 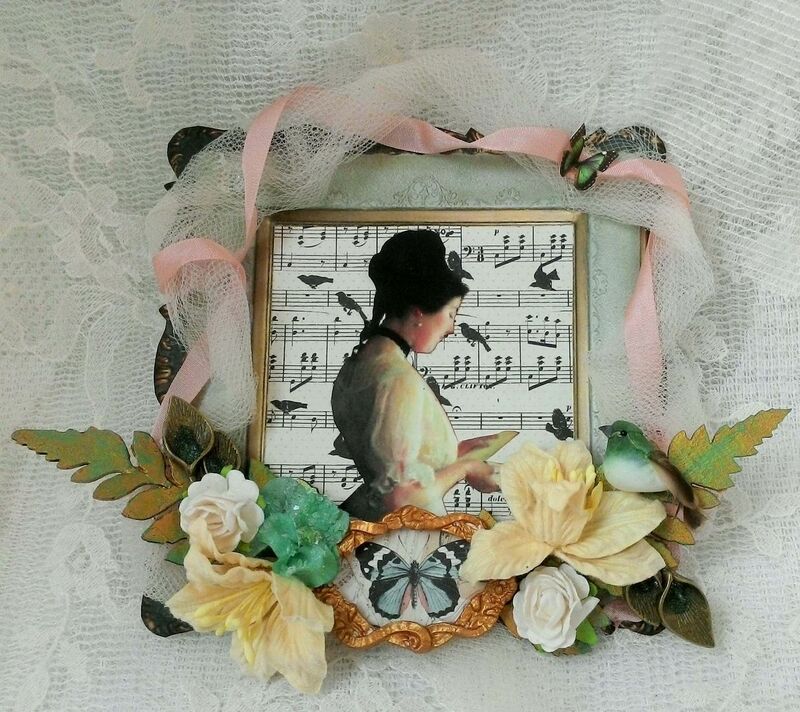 I accented the frame with ribbon and tulle. 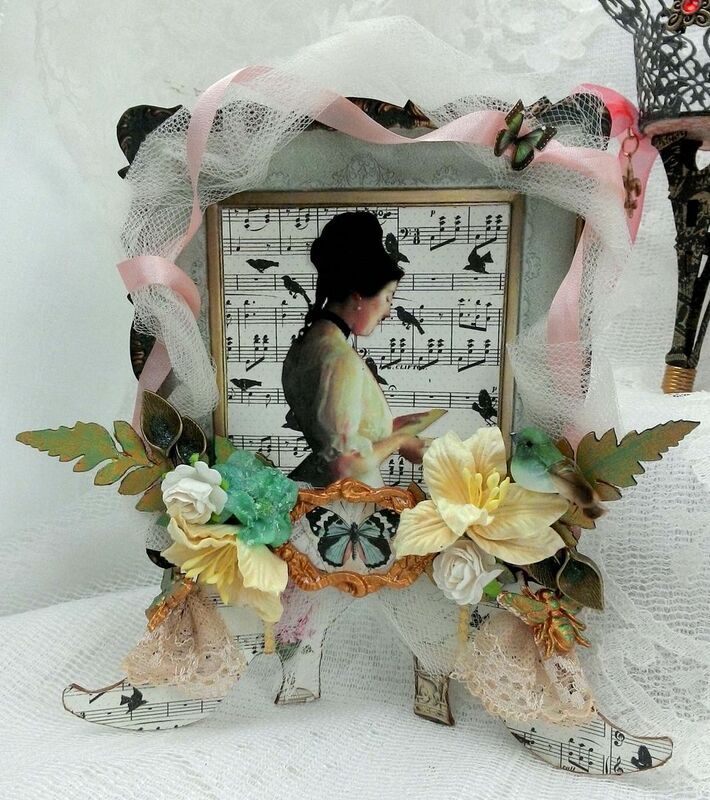 I used the Harmony paper in the background and the image is from the Go Away, I’m Reading collage sheet. 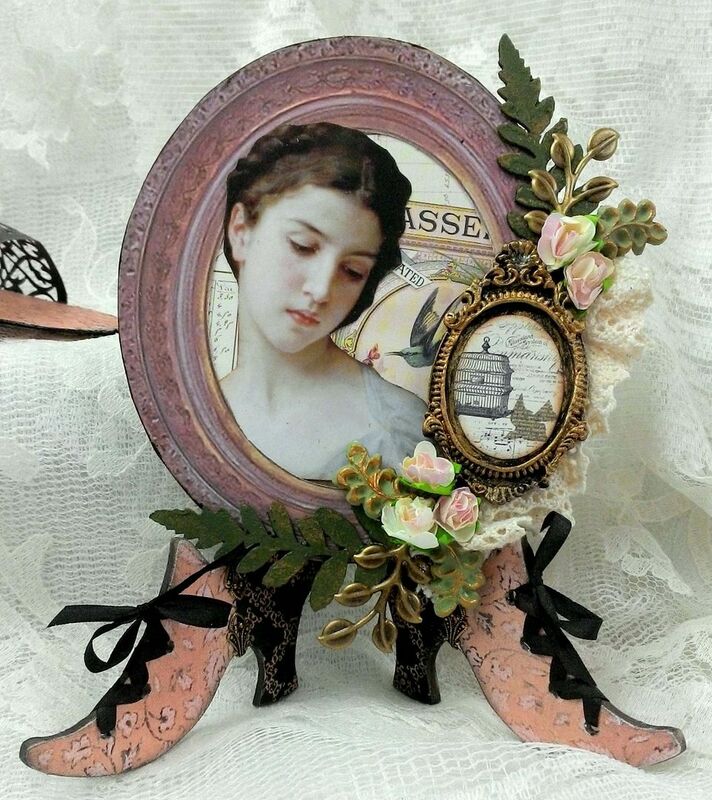 The frame at the base of the piece is paper clay that was made using the Oval Mirror Frames Silicone Mold. The large leaves are die-cut chipboard. 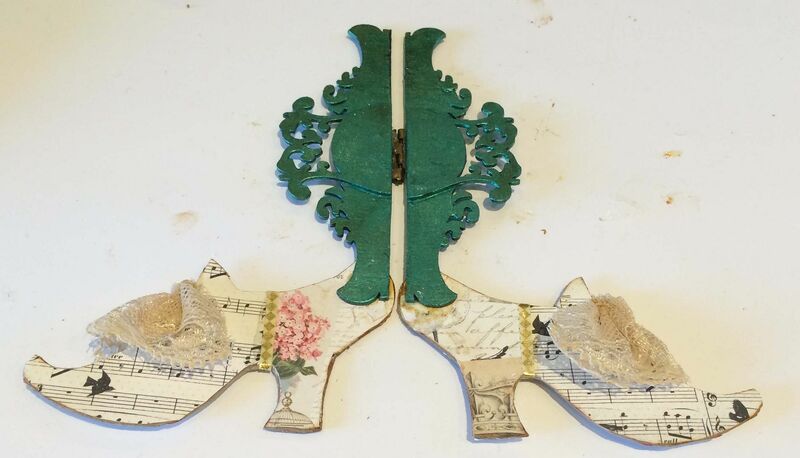 Brass leaf charms, paper flowers and a bird complete the piece. 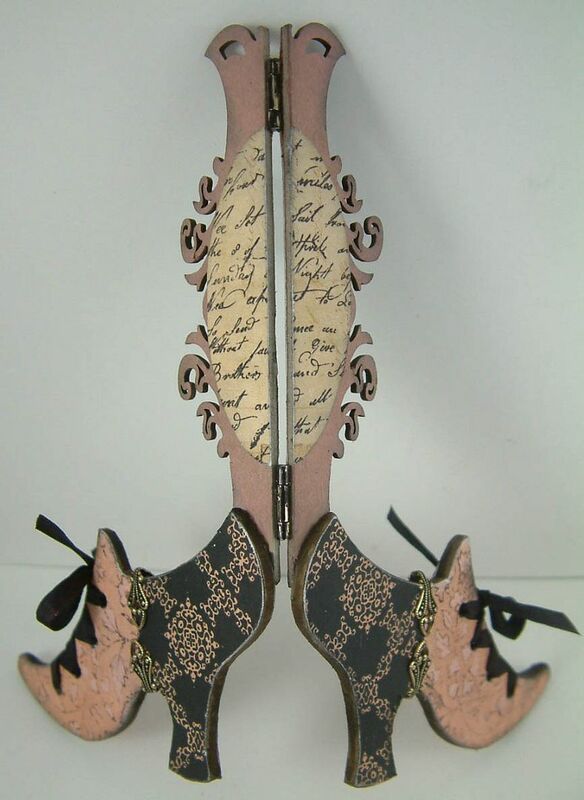 The shoe stand in this example is actually one I made a few years ago using the Alamanc paper pad. 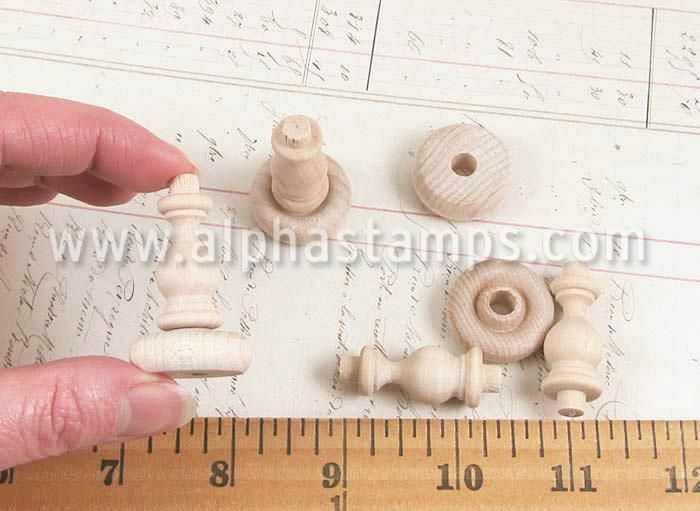 Alpha Stamps was able to get their hands on some more of the paper so I thought I would include this stand as an example too. I also created a new collage piece to go with the stand. 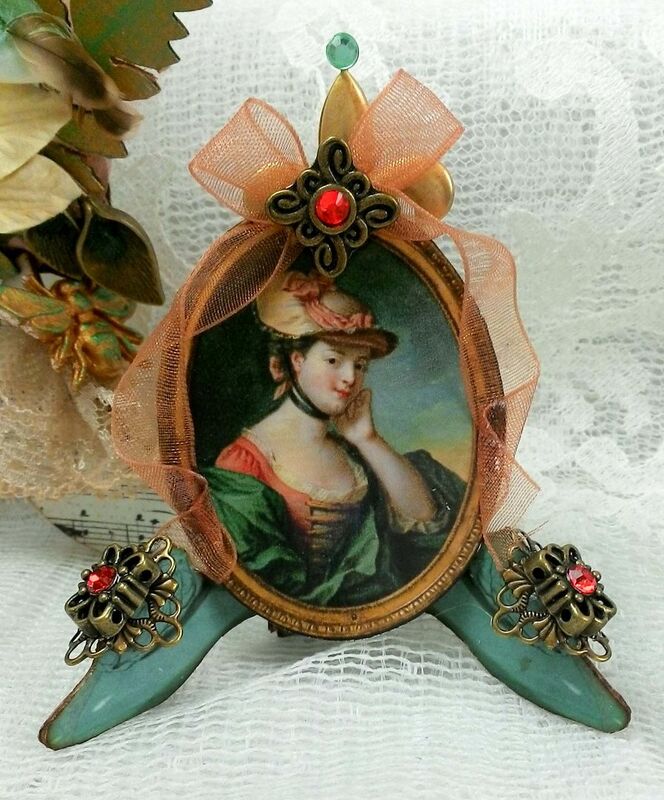 This shoe has a long label for the back which unfortunately is no longer available, but you can achieve the same result by combining two labels, as I demonstrated with the teal shoe stand above. 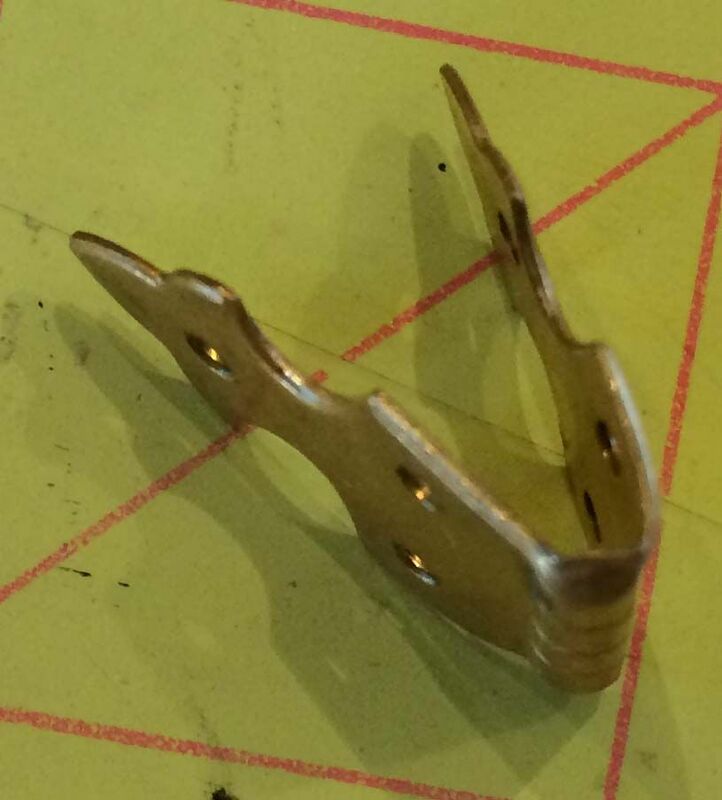 In this example, I used two small hinges that are on the front instead of the back. 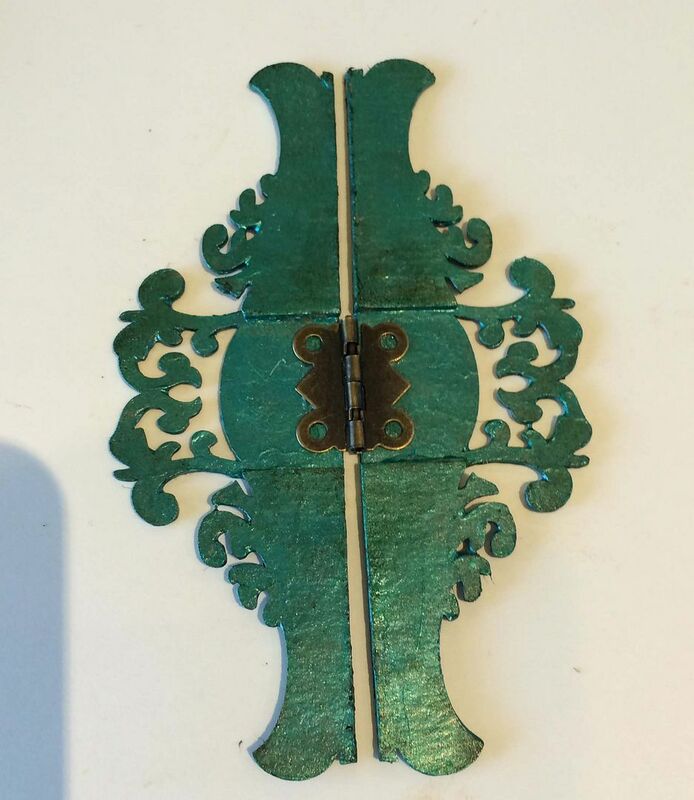 The holes of the hinges are covered with a bead. If you are going to use beads just make sure that they are not too large that they prevent the stand from bending together. 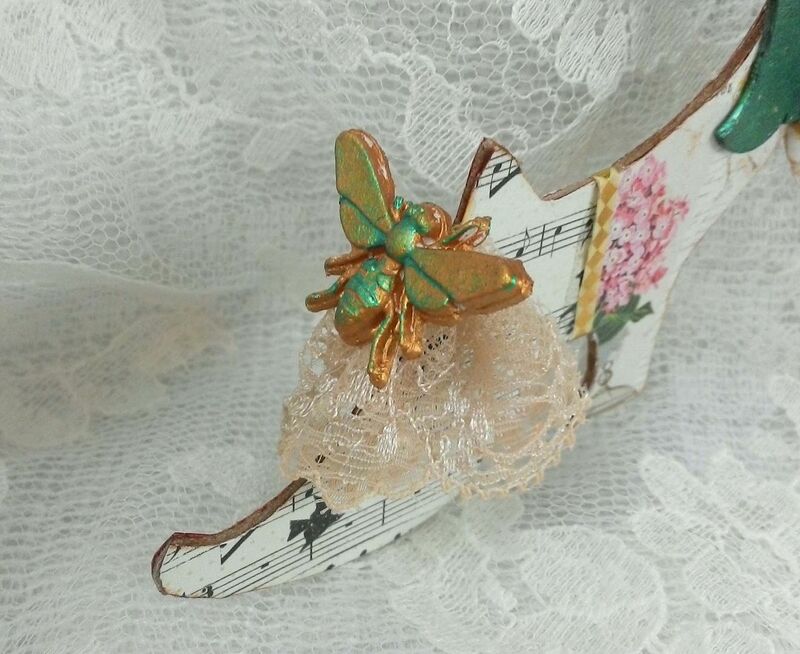 A cute decorative touch for the shoes is to punch holes and lace them with ribbon. I also added fold over bails to the center of the shoes where the different papers meet. 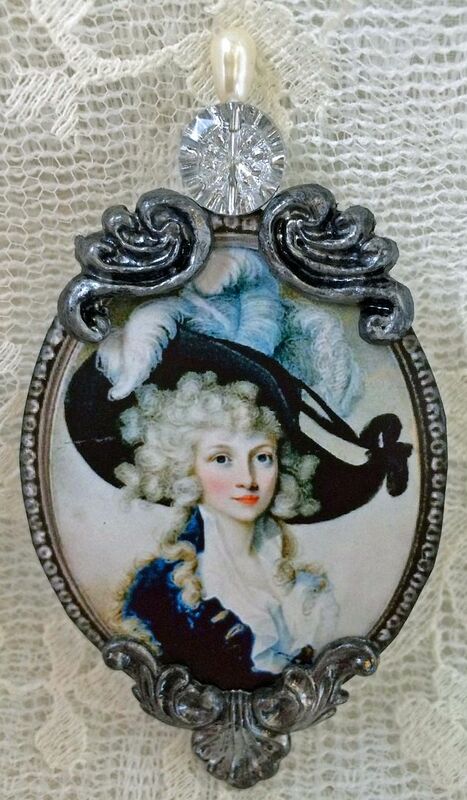 The frame piece is from the Elegant Frames Digital Image Set and the paper is from the Harmony paper pad. The large leaves are die-cut chipboard and the small light green leaves are made from paper clay using the Small Flourishes Silicone mold. 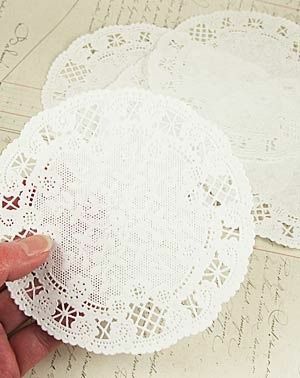 In the background is gathered lace. 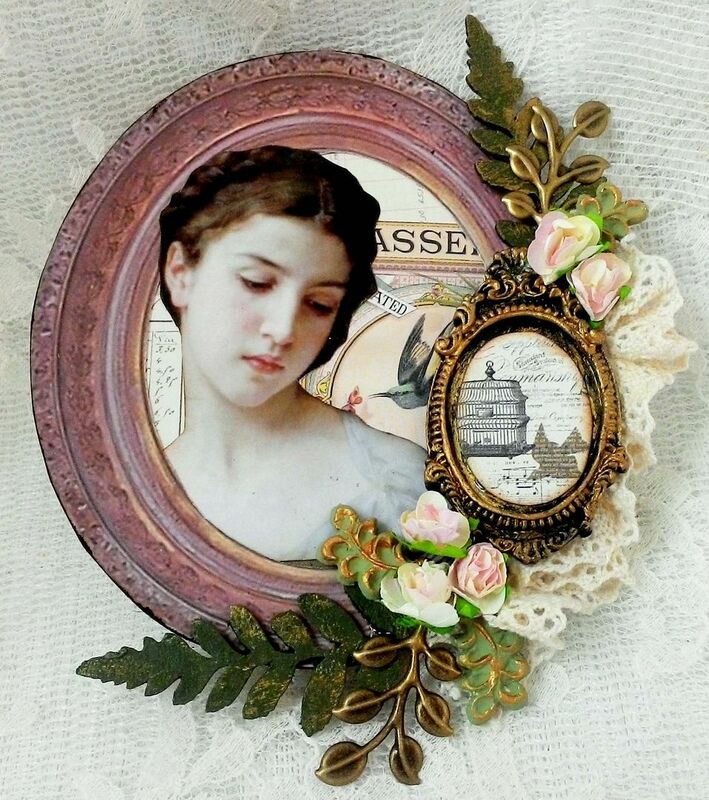 The small black and gold frame is made from paper clay using the Oval Mirror Frames Silicone mold. 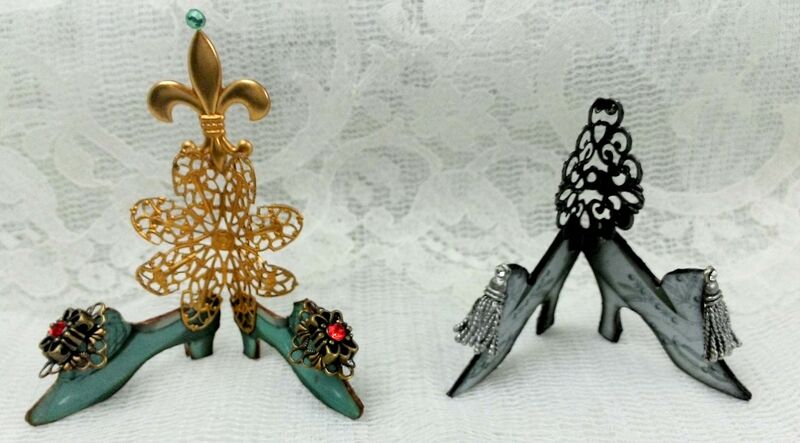 These mini shoe stands are quick and easy to make. 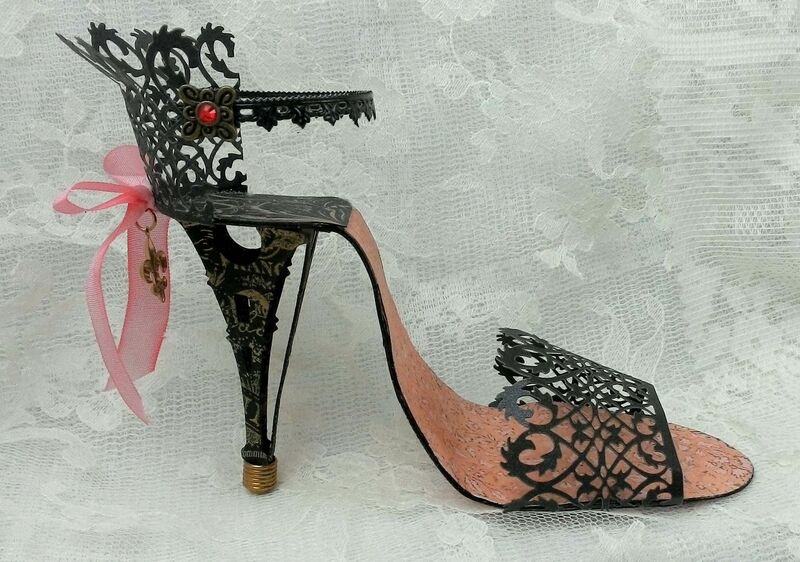 All you need are images of shoes and a piece of filigree. The overall size of the stand is 3” x 3”. 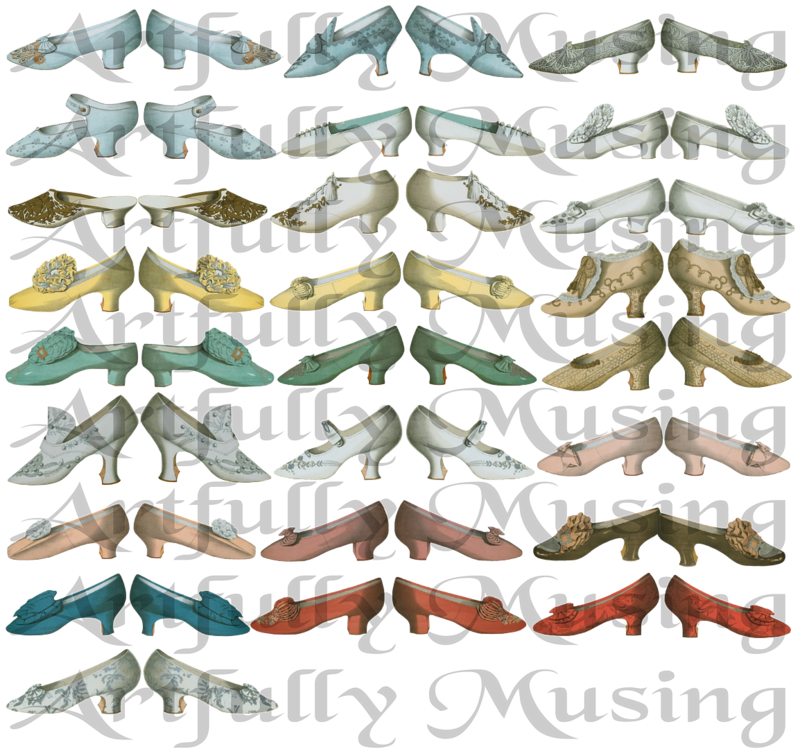 I used 2 sets of the larger shoes from the Elegant Shoes collage sheet. I glued one set to a piece of card stock and cut them out. Next, I cutout the other set and glued them to the card stock side of the first set. What you should end up with is three layers consisting of the shoe image on the front and back and a piece of card stock in the middle. 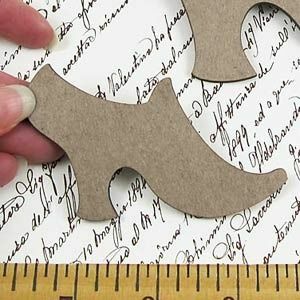 Instead of card stock you could use very thin chipboard. You want the shoes to have some stiffness but not so thick that you can’t cut them out. Next, I inked the edges. To connect the shoes I used a piece of filigree which I bent. 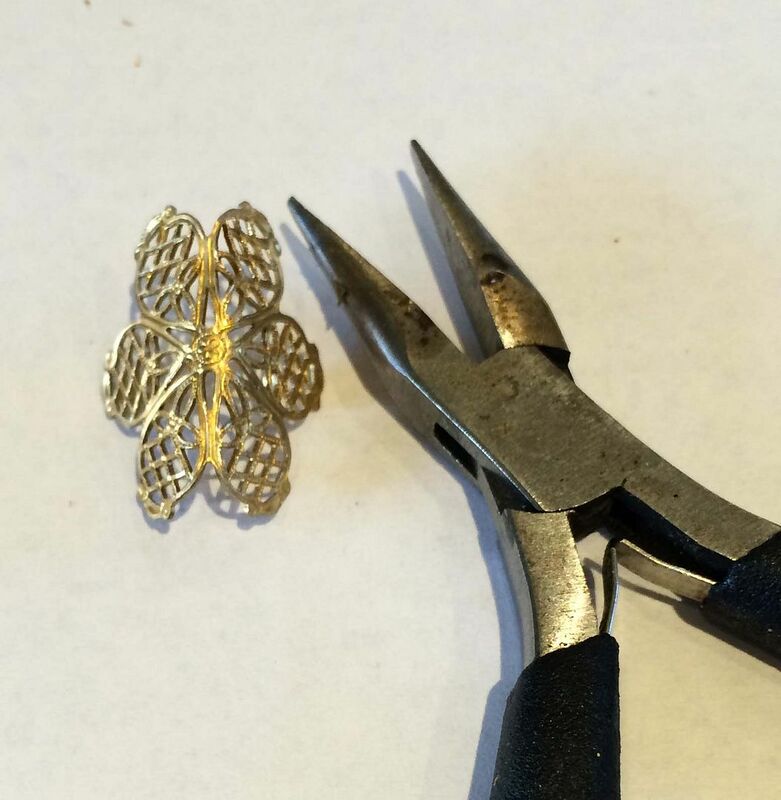 I suggest that you make the piece that you are going to put the stand first, that way you can use it to decide how much to bend the filigree. The more you bend it the closer the shoes will be together. You want to make sure that the shoes are close enough to hold your piece. 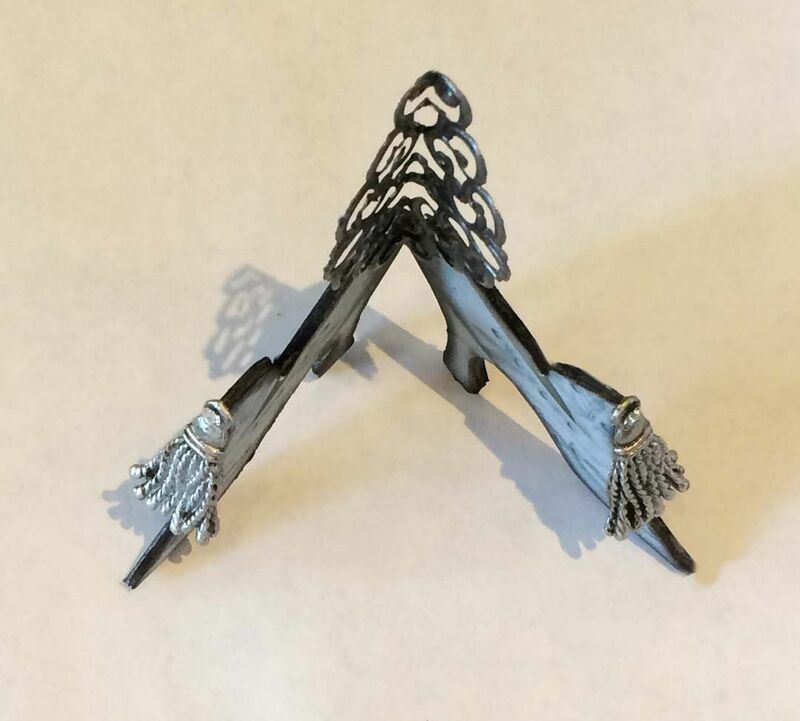 For the filigree in this example, I first bent it in half and then bent out the edges. First, I like the way it looks (edges bent out) and if I didn’t do this the filigree would pushed the picture too far forward. For decoration on the top of the shoe, I bent a piece of filigree and topped it with a slider bead. 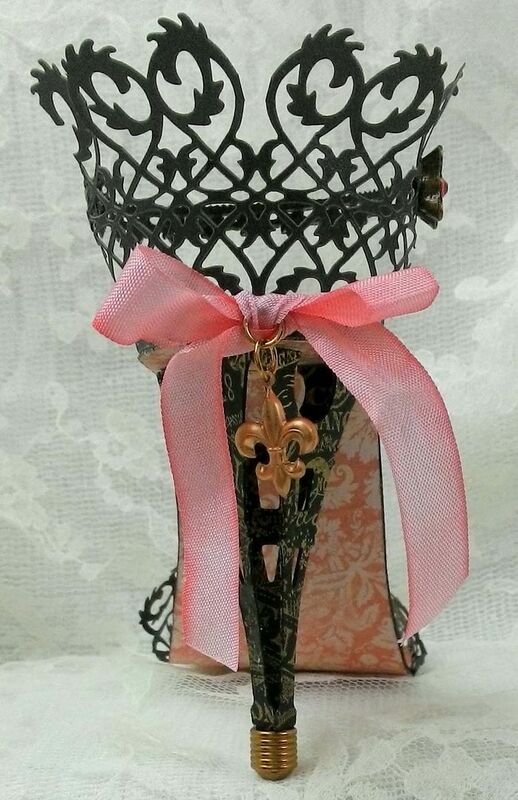 To the filigree I added a fleur de lys and a rhinestone. 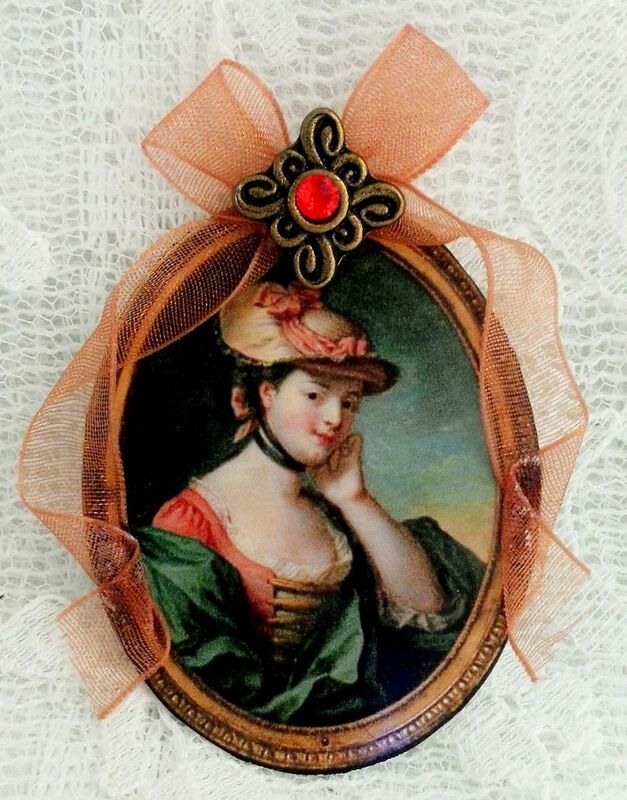 For the art piece, I used one of the portraits from the Portraiture collage sheet, some sheer ribbon and another slider bead. 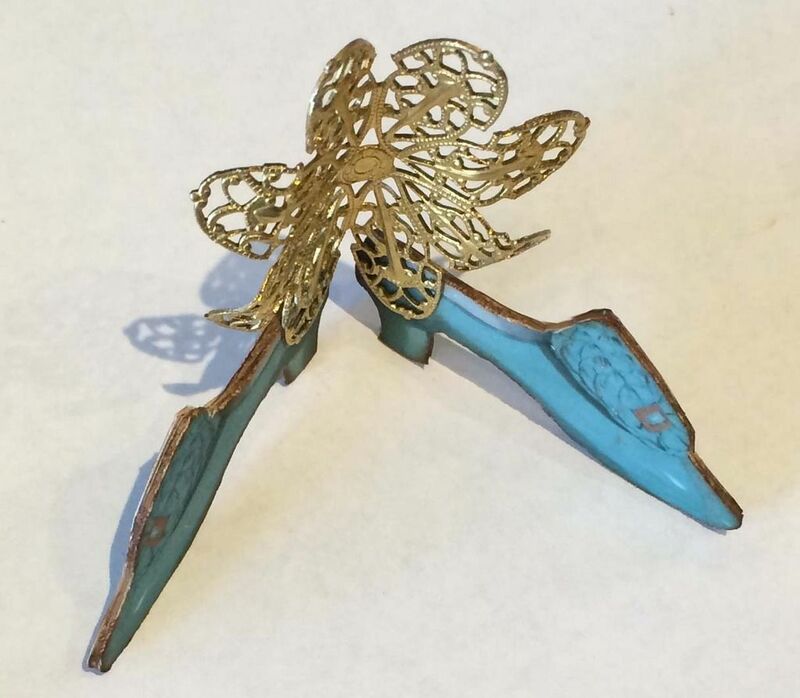 This shoe stand was constructed the same way as the teal stand. 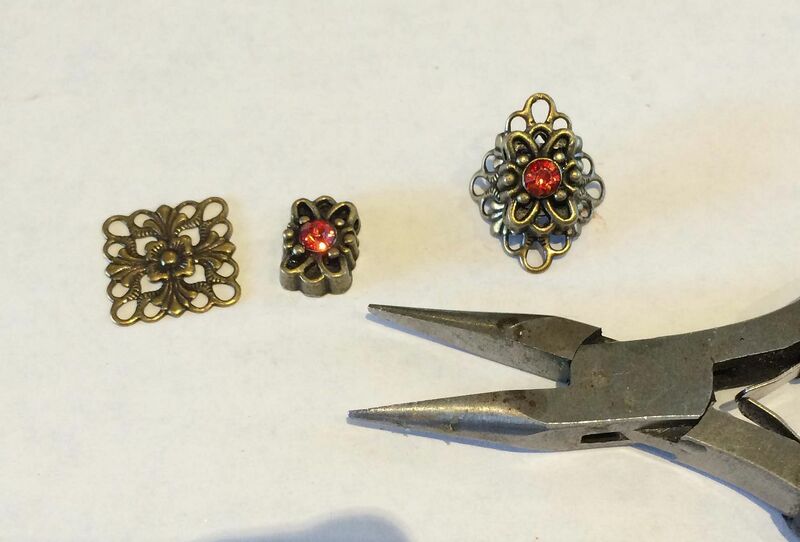 The only difference being the piece of filigree. 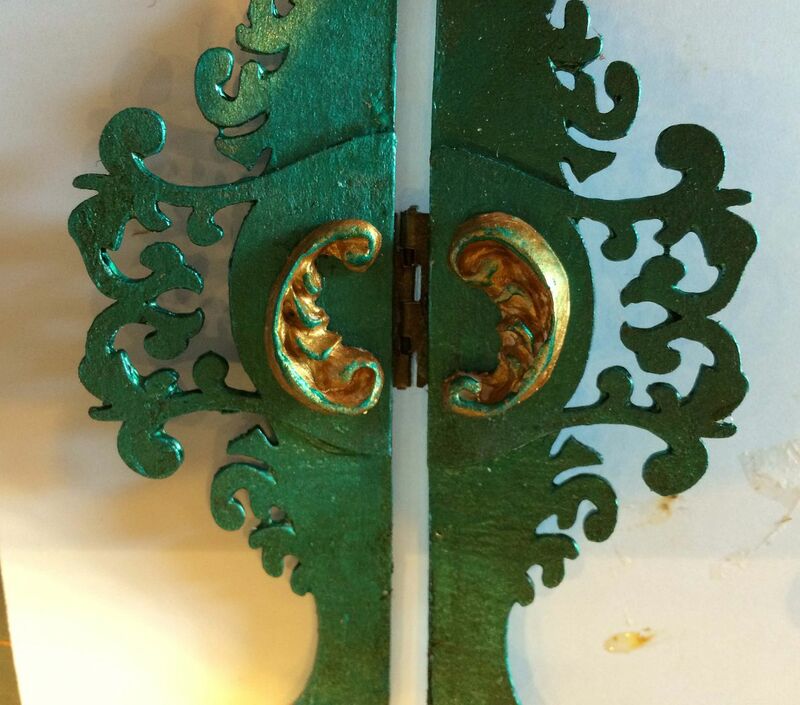 You can see from the picture below that I bent the filigree in half. The tops of the shoes are decorated with tassel charms which I painted with Pewter Liquid Pearls. For the art piece I used one of the portraits from the Portraiture collage sheet, a pear shaped stickpin which is inserted into the shaft of a button from my stash, paper clay swirls made from the Small Flourishes silicone mold painted with the pewter paint and a brass corner also painted with the pewter paint. 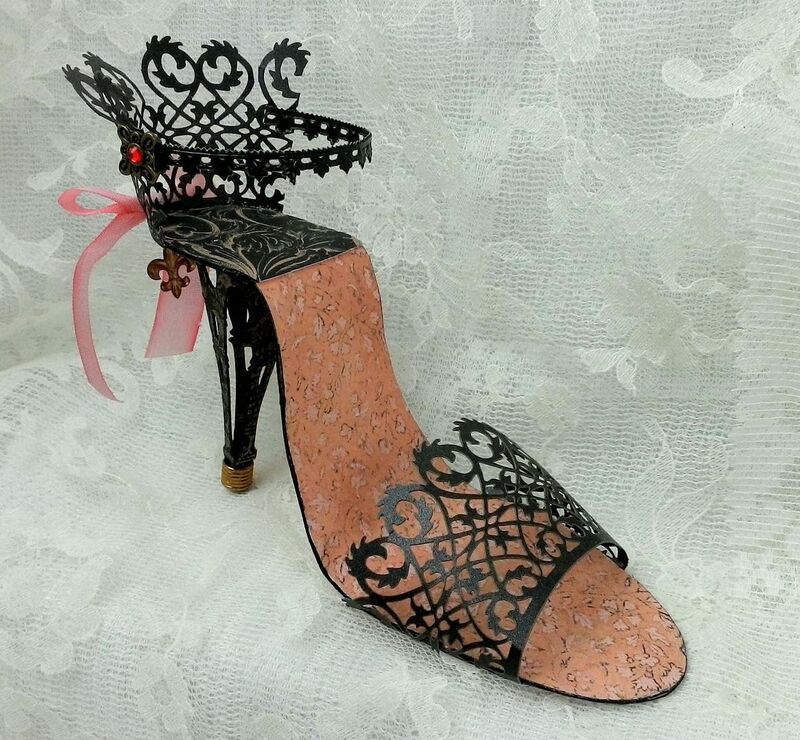 The inspiration for this shoe is the Die-cut Black Wrought Iron Fence Wrap. It’s been sitting on my work desk for a couple of months waiting for inspiration to hit. At the same time I’ve been thinking about making some paper shoe patterns (I know some of you have been asking for me to do paper shoes). As I was working on a pattern I started thinking “why not make this really simple so that more people will want to give it a try”. By using the wrap it takes away some of the complexity of cutting and fitting together a pattern. The only pattern for this shoe is for the sole . One fence wrap gives you enough material for the toe of the shoe and the back of the heal. Start by printing out the shoe pattern below. Notice that there is a direction to the pattern. Both of the feet are slightly curved in the same direction. 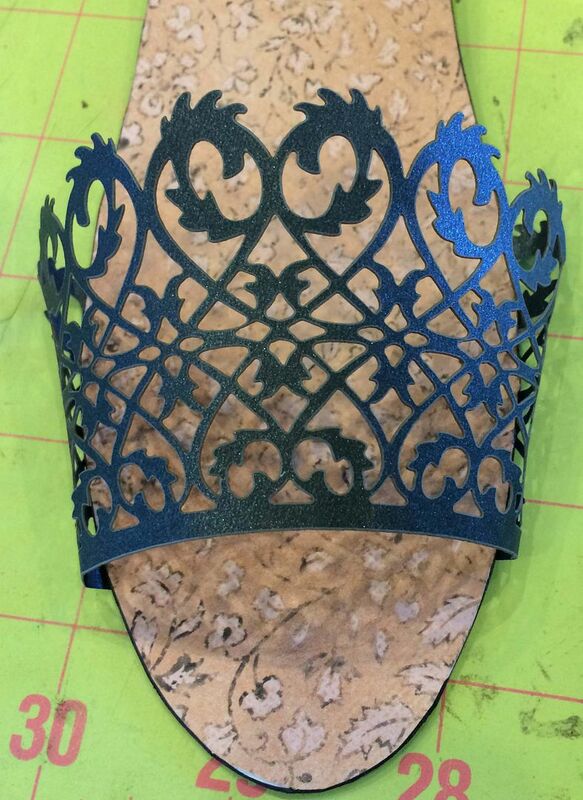 The bottom layer of the sole will be made up of decorative paper and a pattern piece. 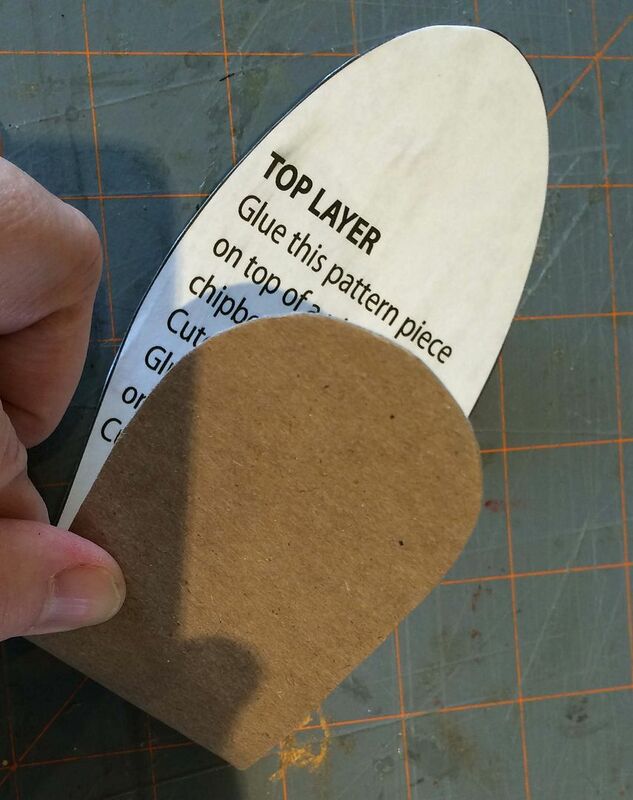 The top layer of the sole is made up of a pattern piece, a piece of thin chipboard or cardstock and decorative paper. 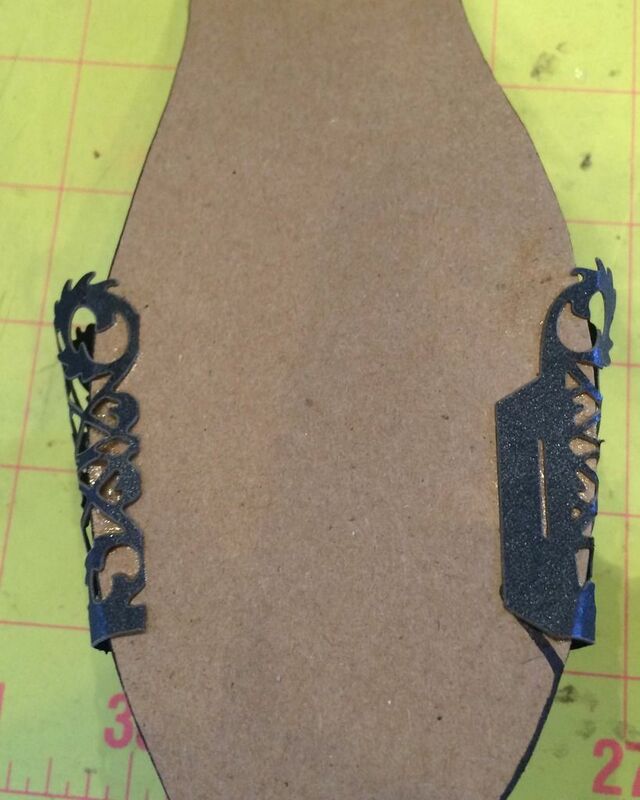 The two layers will be glued together to make the sole of the shoe. The layers must be glued together in the right order. 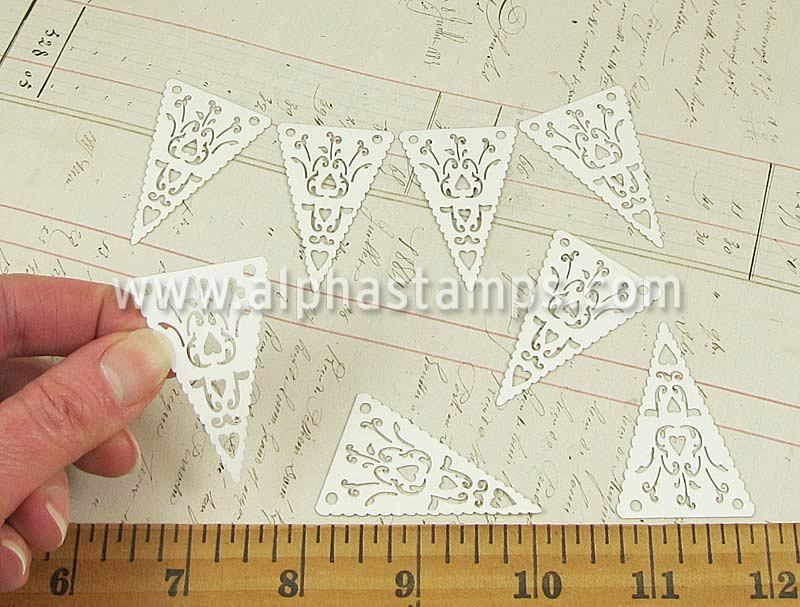 Glue decorative paper underneath the pattern piece with the decorative paper facing down. Cut out the pattern. 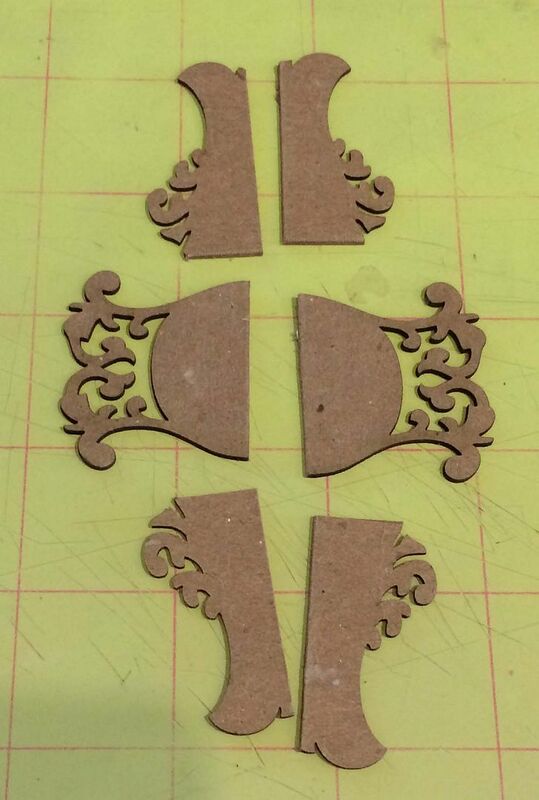 Glue the pattern piece on top of a thin piece of chipboard and cut out the pattern. If you don’t have thin chipboard, use cardstock instead. You don’t want the shoe to get so thick you can’t bend it. 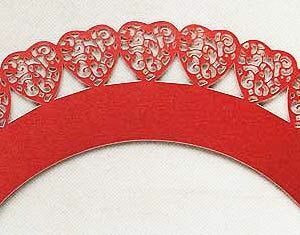 Glue decorative paper on top of the pattern and cut out. Cut the piece of fence wrap to make the toe and heal. Notice that one of the heart shaped pieces on the wrap is centered on the shoe. To decide where to cut – I used from the tab end (which I used to attach the wrap to one side of the sole) plus 3 heart shapes (so that one would be centered on the shoe) and a little more past the 3rd heart shape to wrap on the other side of the sole. Glue the cut piece onto the top layer of the sole. I used E6000 glue. Don’t worry if you can see the glue under the shoe as it will be covered up with the bottom layer of the sole. Glue the bottom layer of the sole to the bottom of the top layer of the sole. 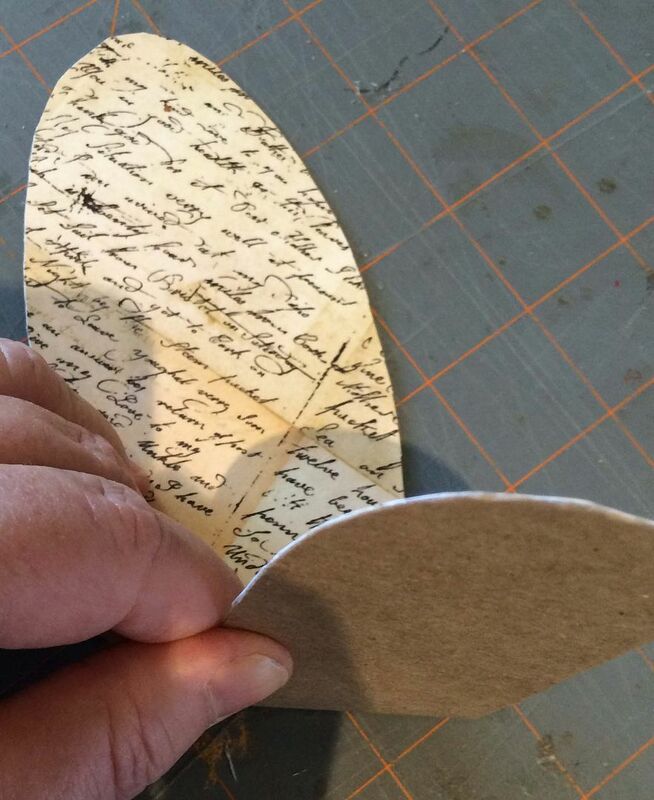 You should now have complete sole with decorative paper underneath and on top. NOTE: When you are gluing the pattern, paper, chipboard and then the layers together make sure you apply an even coat of glue to all of the pieces. If you don’t, when you bend the sole to make the shoe shape the layers might separate and or the paper might lift. Next, I inked the edges of the sole. To give the shoe it’s shape I bent the sole. The first bend I made was at the top. Notice how I used two different papers to cover the sole. I liked the look of the two papers but it also helped with knowing where to bend. The black paper extends 2” from the back of the shoe and this is the point where I put the bend. Don’t make the bend at the bottom until you add the heel to the shoe. 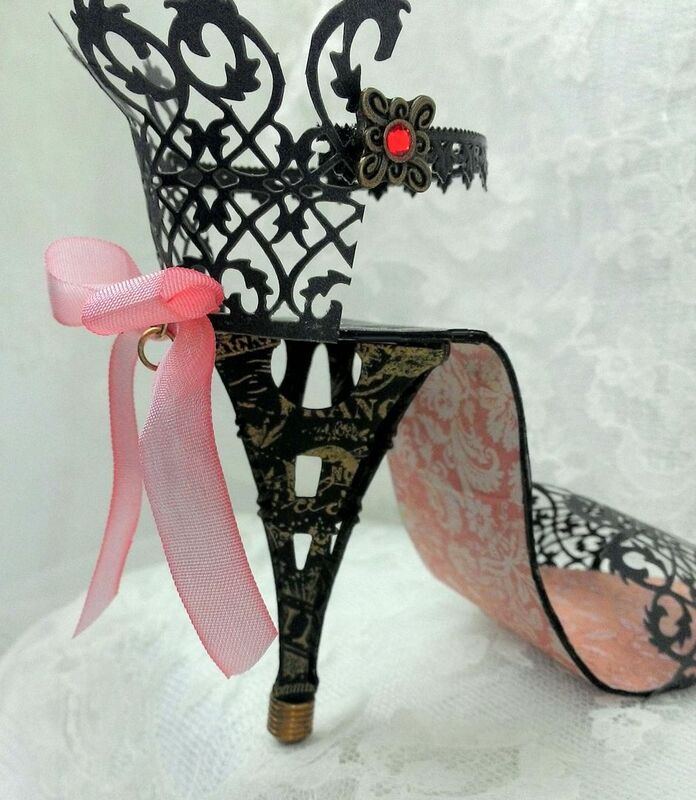 I thought a French themed shoe would be so cute with an Eiffel tower as the heel. 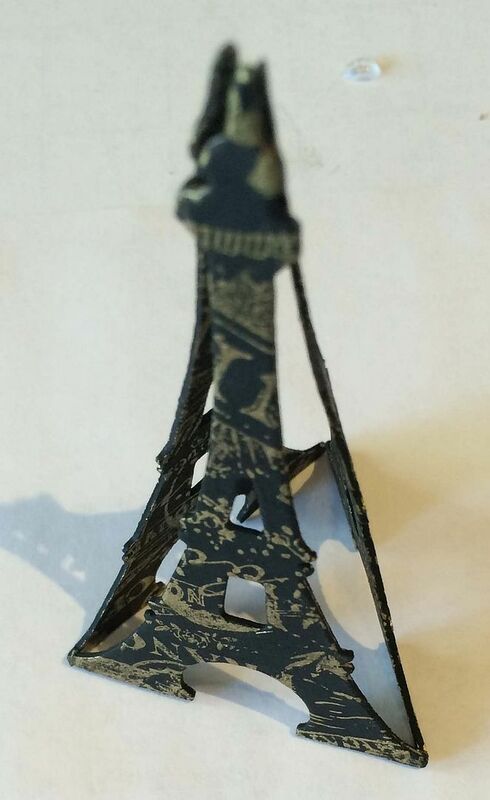 I started by painting three chipboard Eiffel towers black. 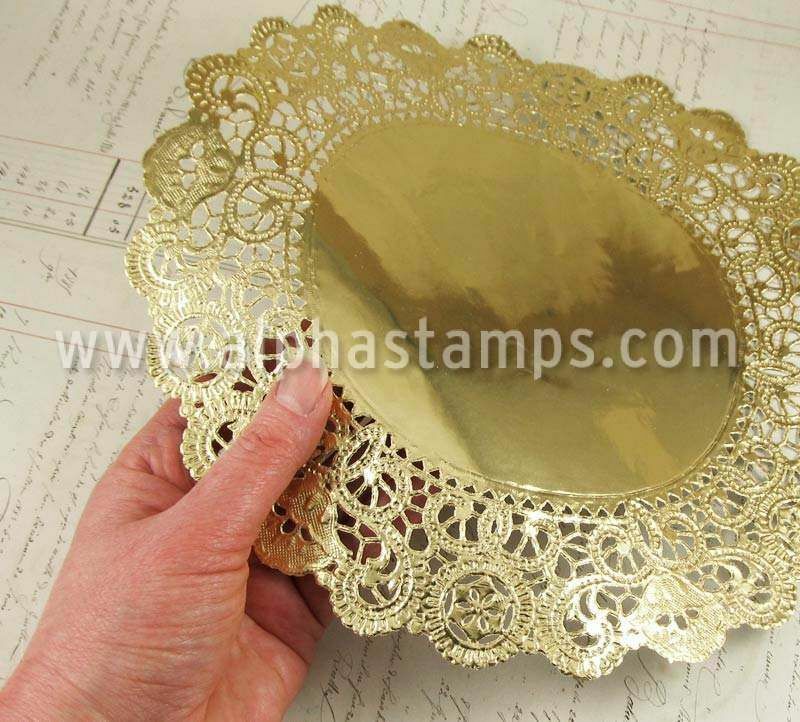 Next, using gold ink and the French Floral Collage rubber stamp I stamped the towers on both sides. If your stamp has a direction, keep that in mind while stamping. Since the towers are going to be upside down, I stamped them upside down. I glued the towers together using E6000 glue. For an extra decorative touch I glued brass foot to the top of the tower. Using E6000 I glued the towers to the bottom of the shoe. Now that you have the heel in place you need to make the second bend. The reason you need to wait is that the height the heel will determine the amount and location of the bend. You need to bend the sole so that the front of the shoe sits flat on the surface. 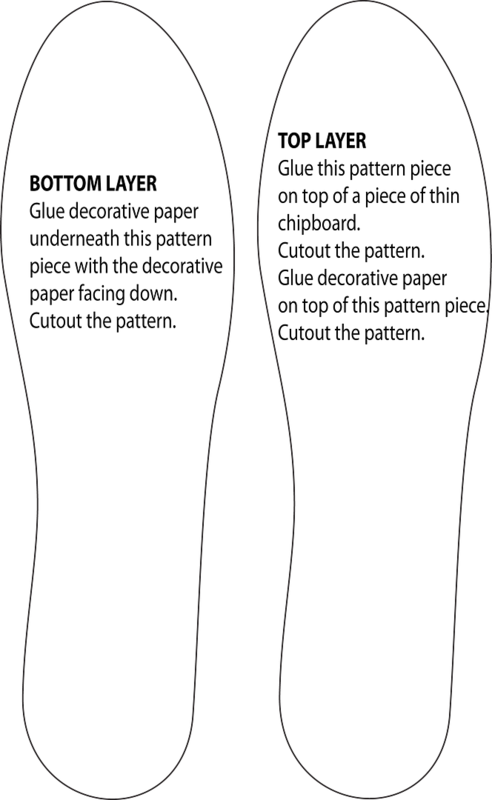 The bend in the example piece is approximately 3 ¼” from the front of the shoe. The last step is to attach the back piece. 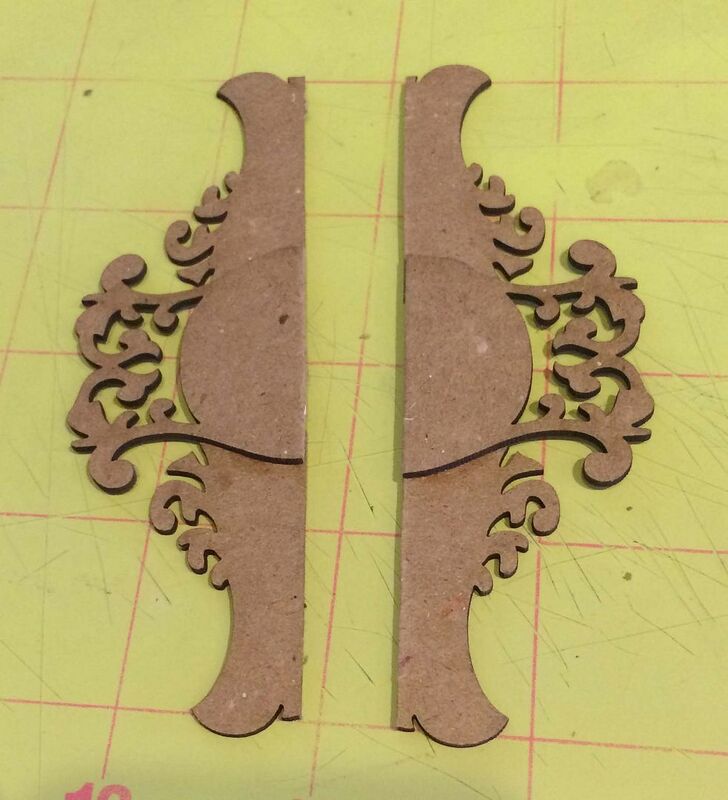 Using the remaining fence wrap, trim the edges so that the decorative scrolls match on each side. I also bent back the heart shapes. 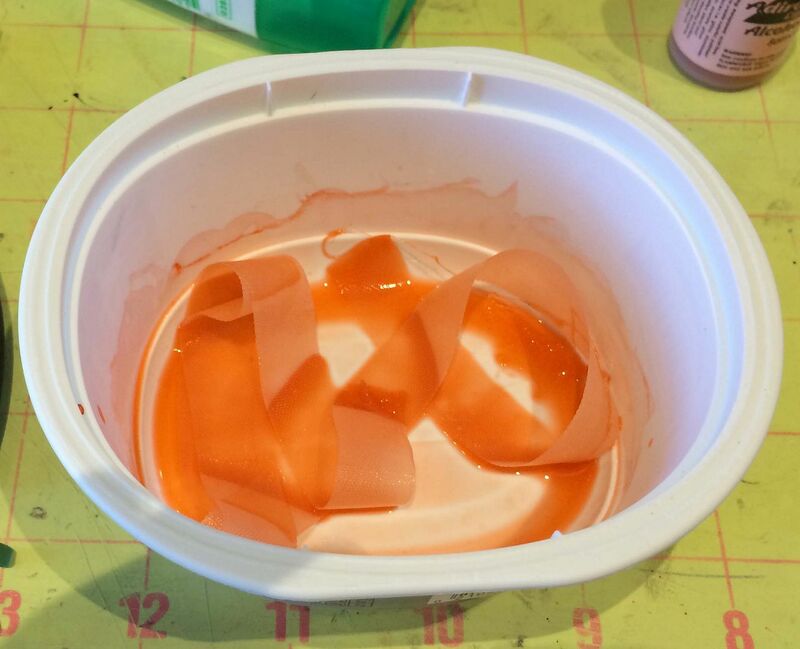 Attach the fence wrap to the back edge of the sole using E6000 glue. I added a piece of Dresden as a strap decorated with slider beads (the Dresden is glued to the inside of heel piece). NOTE: If you add something with any weight to one side you must add it to the other or the shoe will fall over. This is because of the height of the heel. If you use something else that is shorter for a heel you may not have this problem. To the back of the heel I also added a ribbon which I dyed with Mountain Rose alcohol ink. Hanging from the bow of the ribbon is a fleur de lys.